Hello Everyone. Well, another AGM has been and gone. I feel honoured to have been voted Chairman again for the coming year and hope that I can keep everyone happy. Also, Mick W is still Secretary and Mike S, the man who looks after the money is still our Treasurer. I would like to welcome Stuart Fletcher and Geoff Bethell to the committee and look forward to their input. I would like to thank Paul Bailey who has worked hard as chief boiler inspector and has now decided he would like a rest and I have now taken his place and hope to keep up his good work. Another year has passed and one or two changes have been made to the committee, lets hope new blood will mean new points of view and more ideas for making BDSME even more successful. We have the dinner to attend on 13th January 2019 at The Olde Windmill Inn at Great Cressingham. 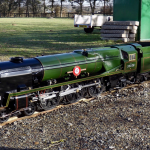 We also have the London Premier Model Engineering Show at Alexander Palace during the weekend of 18th 19th and 20th of January 2019, advance tickets are available. We are still working at the track every Monday, Wednesday and play/work on Saturdays, so you are all most welcome on these days to come and help, or just to come and see where we are up to in the track work. 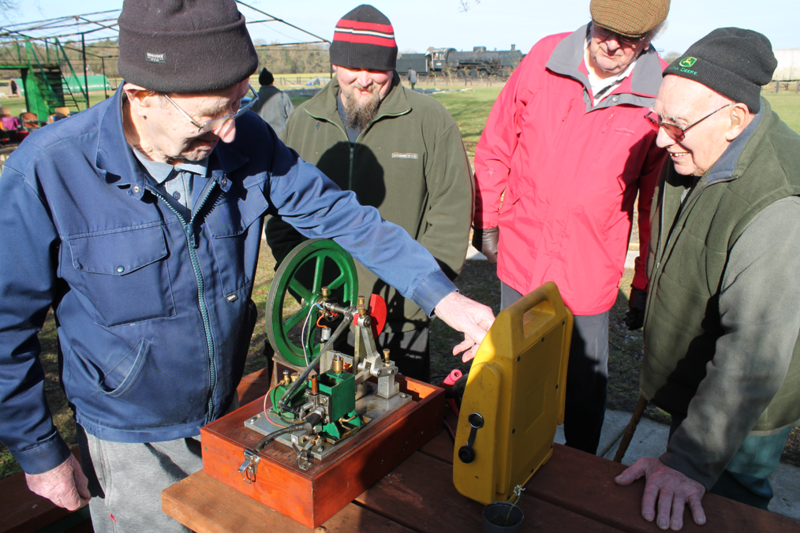 A. Mike H and Paul B have with some help, rewired and updated the signals. B. 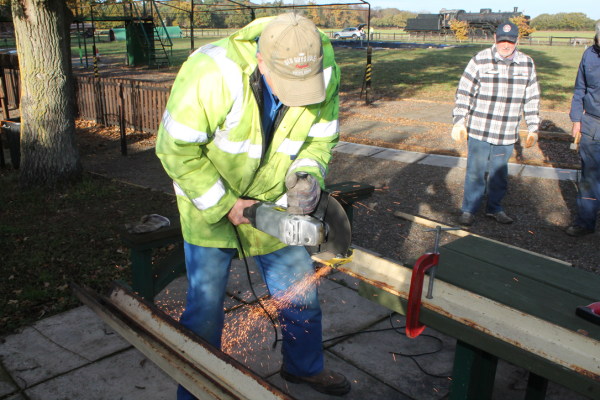 We are building two 7 1/4” gauge style pits for maintenance and dropping the fire for the larger 7 1/4” gauge engines. I will start with B. B. The two pits, first one has been put to the left of the moveable rails leading into the Loco Shed. 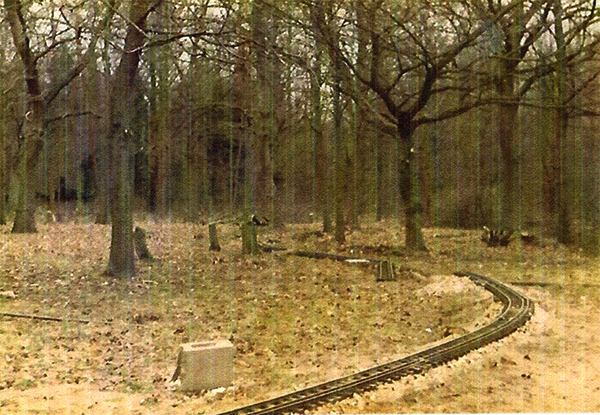 Geoff E has built a new set of points which have been installed in the track just before the Ladies Toilet, this give us a branch, left into an Eight foot by Five foot pit which is lined with blocks and then the two sides have a railway type size sleeper on end at the sides giving the loco men an eighteen inch deep pit to fire and maintain their engines. The floor has been tiled with slabs, and at present Geoff E is welding up all the steel work, all found available under the Work shop, once all is welded, we will lift it out and paint it to stop it rusting. 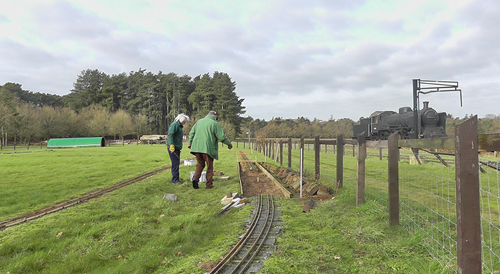 We are digging out the soil from the points to the pit so we can lay a new ballasted layer of track for the rails to be laid on and welded into position. When this is complete we will do the same type of pit along side of the lift pit, this will require a three way set of points, but when it is finished it will certainly move us into the large engine capability, so watch this space in the future. 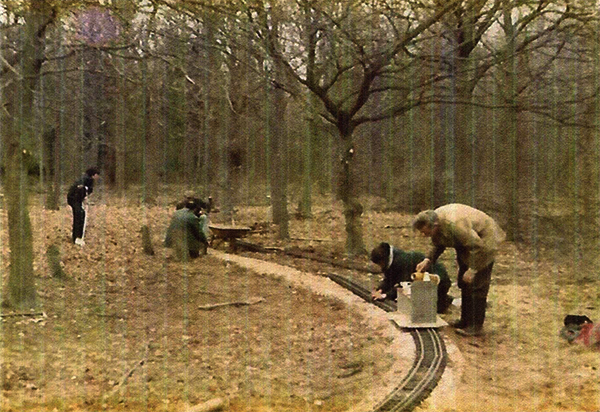 Top left, Geoff B cutting the frame for the track bed. Right, The position of the new points, still some work here , but this gives us our branch to the 7 1/4” pit. Below, Only the “ Health and safety things to finish, and the track back to the points and we are in business. 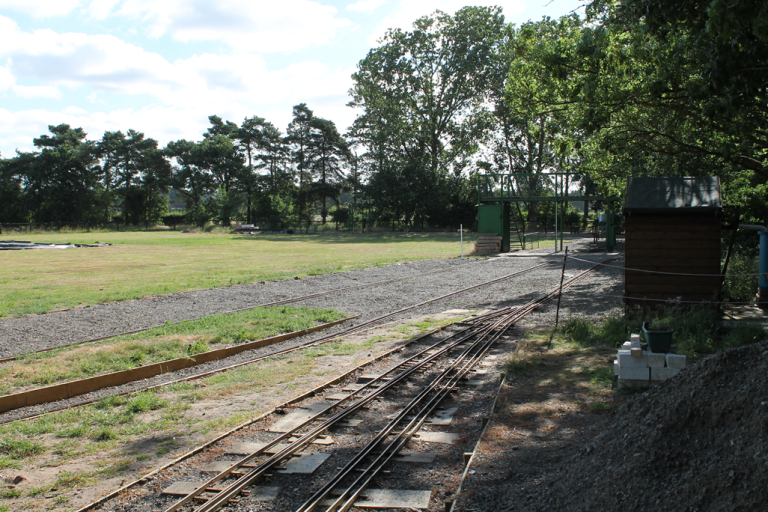 Mike H continues to make progress with the modernisation and upgrade of the signal system. Based on the original work undertaken by Myles C, the new system closely follows his prototype system, but with a few changes. 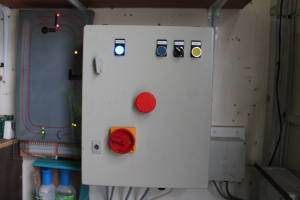 Now housed inside the hut and protected from the elements, the control cabinet houses a PLC (Programmable Logic Controller). Mike H tells me that this device can control the movement and priority of train automatically. 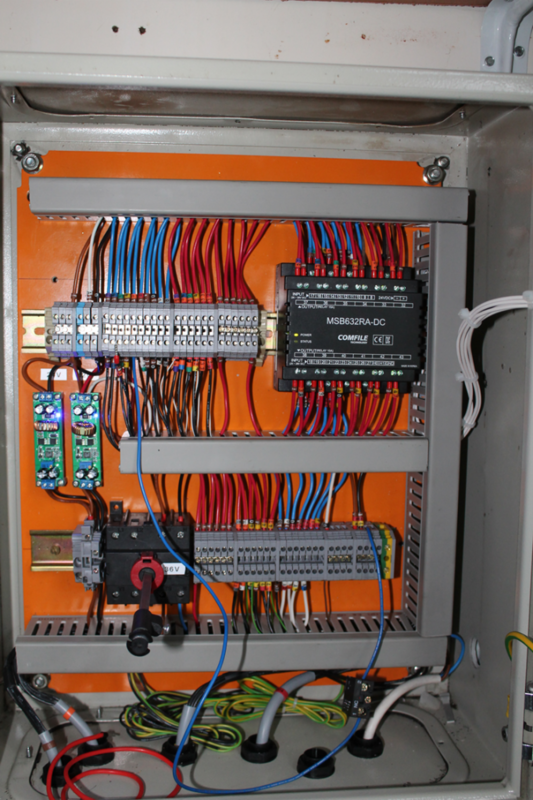 You can see from the photos below that the whole thing is compact and incorporates a mimic board to one side so that the state of the signals can be seen at a glance. Various functions can also be selected from push buttons on the front of the panel. Paul B has reconfigured the batteries to give the correct supply to the new cabinet and has taken the opportunity to tidy up the adjacent cables. The track sensors, all but a couple, have been replaced with stainless steel versions and it is hoped that this will eliminate the issue of corrosion seen on the old brass types which should help reduce the number of bad contacts. To help overcome this problem Mike H has also included additional sensors so that where necessary a loco passing over the sensor will have more than one opportunity to make a connection. Belt and Braces, maybe? These additional sensors also allow better separation of the trains going over the diamond crossover. 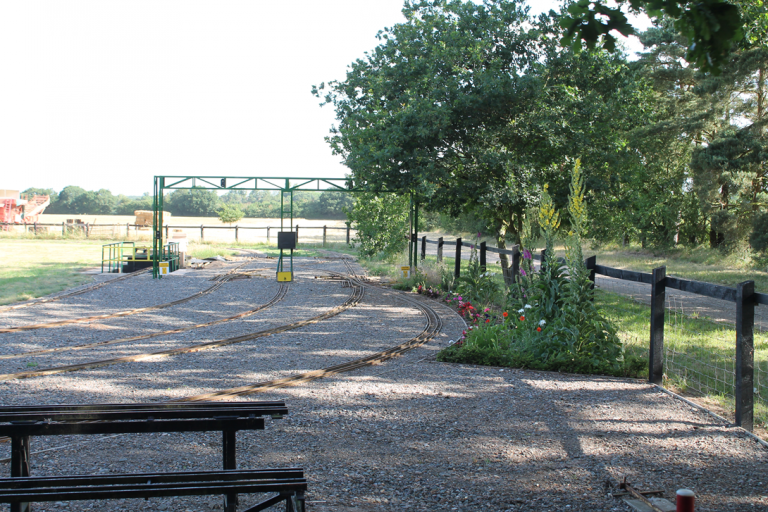 New cables have been laid around the track and the two cabinet’s, one at the foot bridge and the other at the gantry now only house soldered connections back to the control cabinet. Gone are the old screw terminal blocks which were prone to corrosion and failure. 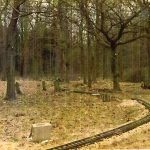 Mike H say that he hopes to be ready to start testing by February 2019. The Box inside the Hut with the Repeater on the left, needs to be seen to get the full potential of the work. Thank you Dave Beeken for sending me these photographs of Brandon track through email; this was when Dave came along at the Anniversary Sunday. If anyone can throw any light on any of these people, please let me know. Well Hello! Where has the year gone? 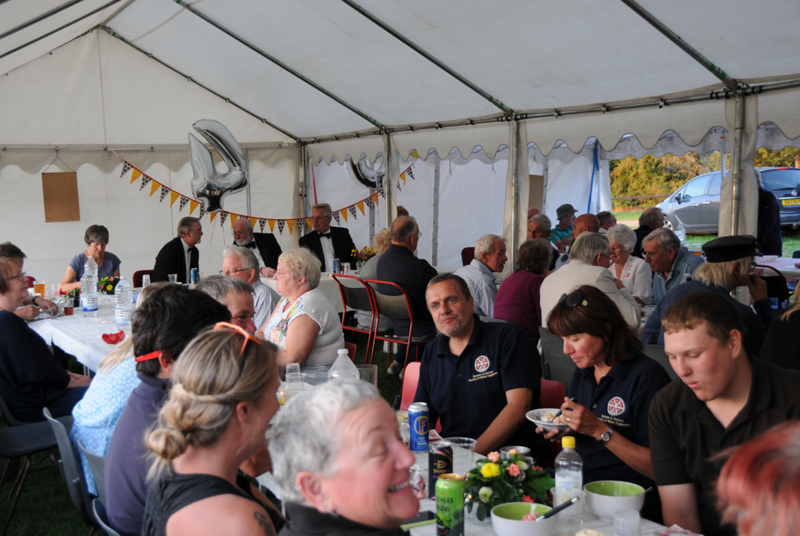 We had our first members running day back in May and then in July, we had The Weeting Rally, our Anniversary at the end of August, and now our AGM is only just a month away. What a busy year?. Well the anniversary was a great success thanks to Peter and the members of the sub committee and everybody else that was involved. 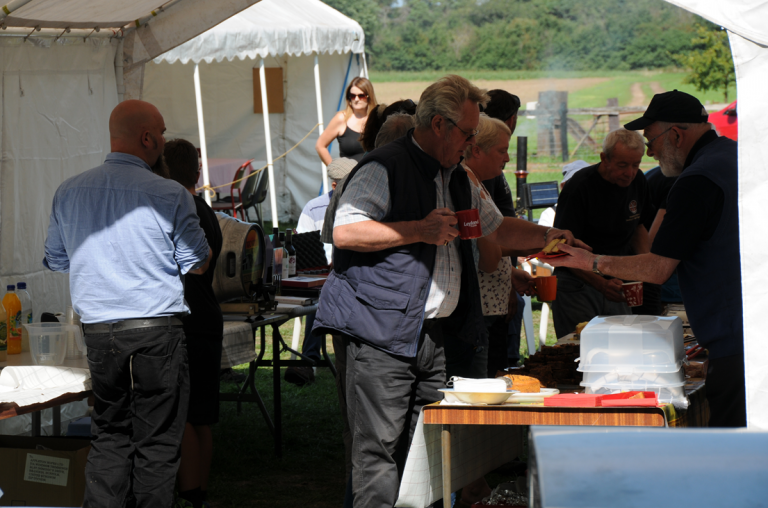 We had a good Weeting rally, so in part, the year has been good to us. We also now have six paid up junior members, so, all in all I think the club is doing well. 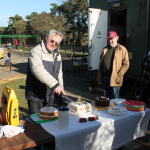 The members who have been working at the track on Tuesdays and Thursdays have done a great job and my thanks goes out to everyone who has helped to make this such a great club. Well, I think I have dribbled on long enough. I hope to see you all at the meeting in October. Below is my report on the Anniversary Dinner, as Kevin B did such a fantastic write up on the hardware at the show I have left this out, only to say WOW what a great show. Thanks to all you members who had a model on show. 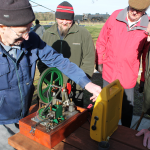 Two things; first the Midlands Model Engineering show is on at Fosse Way, Thursday, Friday, Saturday and Sunday, 18th October to 21st October. Seniors on line tickets are £8.50. It’s a good show and well worth the effort to get there. 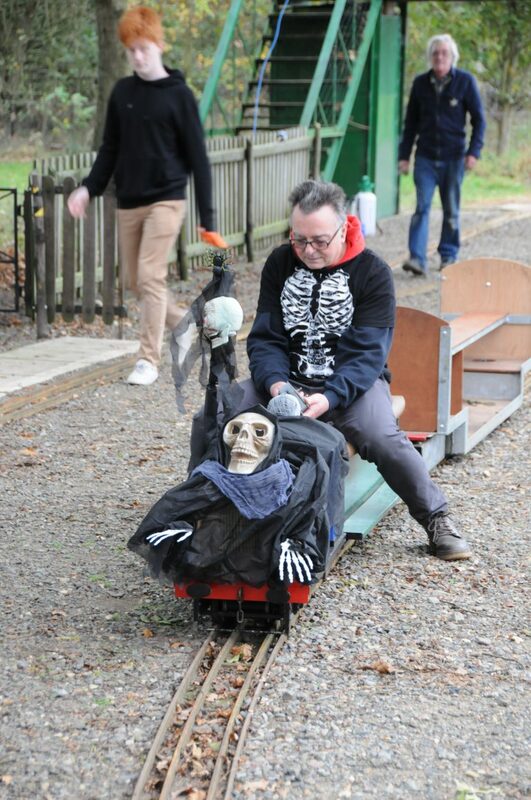 Secondly, our next Family running day will be our Halloween day, Saturday 27th October. Fish and chip tea at cost and will go on till dark. 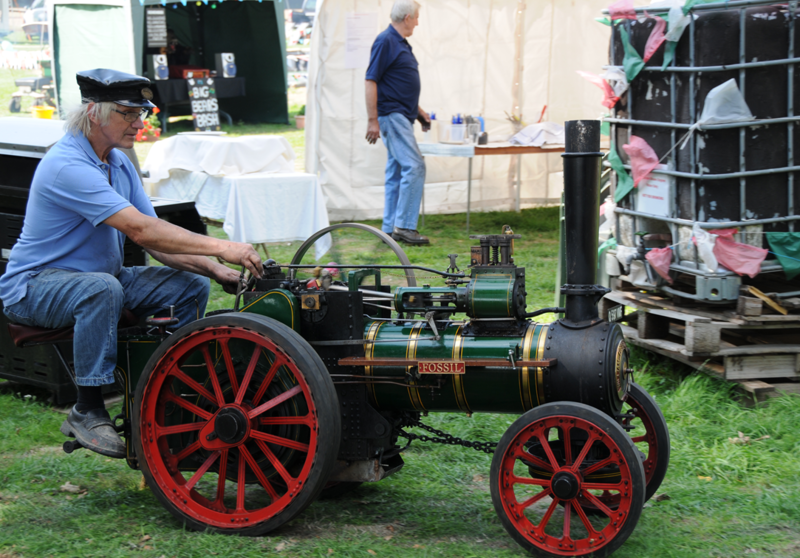 Dressing up an option, an engine or traction engine is essential. There is still a work party at the track Tuesdays and Saturday just now certainly after end of September no Thursdays as it is the shooting season and we do not want to be the targets. 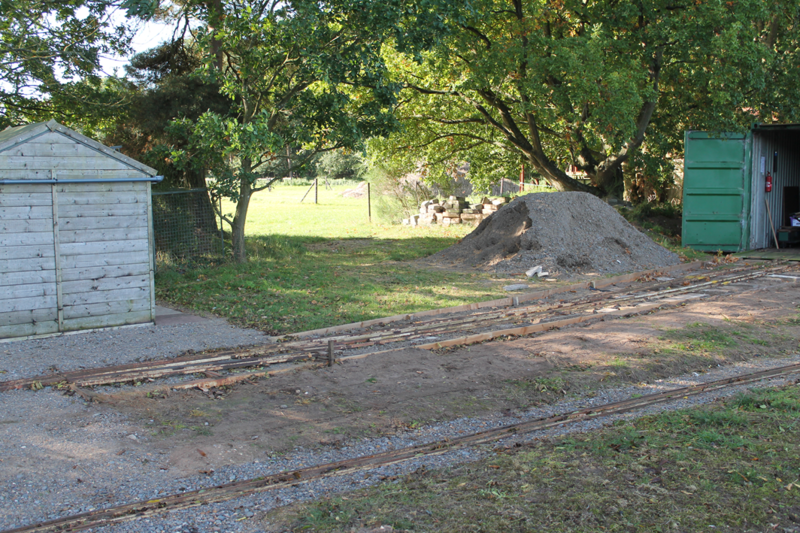 We are installing new cables for the digital signals and we are building a second steaming bay track at the loco shed, mainly for the larger engines and it will have an ash pit, work on the points it needs have already started, and going great. 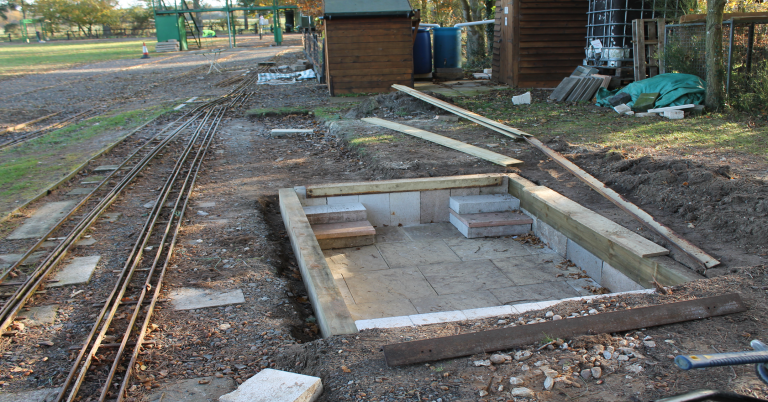 Still to finish is the ash pit and ballasting of the area around the turntable, so still work to do if you are at a loose end, tea is provided, at no extra cost, even if you just want a chat, we are always/well mostly always there. Having now recovered from the trails and tribulations of the Anniversary weekend, I would like to whole-heartedly thank everyone who was involved or helped in any way on this fantastic anniversary celebration weekend. I will not thank you individually, least I should forget someone, but, you know who you are, and I truly thank you all very much for putting in the time and effort required in making this a fantastic occasion. 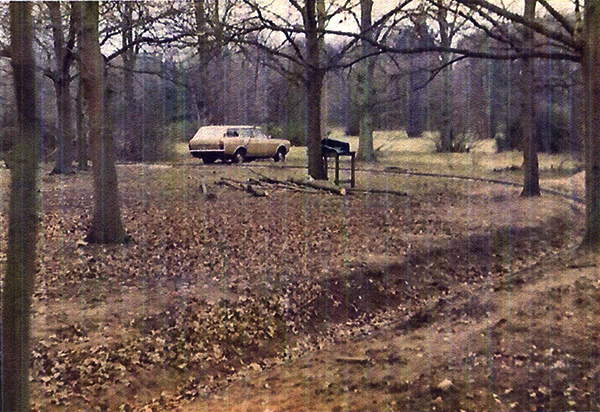 When we first spoke about this year being the 40th, I found a newspaper cutting which said the club had been started in 1978 by a small group of people lead by Mr Ernie Perkins, bringing people out of the seclusion of their garden workshops, it had an active of 25 members. It was set up first in Brandon, but they were plagued with vandalism, so they moved to a second site in Brandon, again this was no better, so they moved to our current site around 1993, and the site was officially opened by Mr R Parrott on 21st May 1994, I believe , not a very nice day weather wise. Back to our 40th Anniversary. A sub committee was set up and discussion’s started on how things were likely to go on the day. Food wise a “Hog Roast” was talked about, but the price prohibited this, other suggestions, pizza van, burger vans and the like were all put in the mix, but hey, this was our 40th Anniversary, it had to be better than what had originally been proposed. We talked about the date and it was suggested to have it over three days, a Friday, Saturday and a Sunday, set up on Friday with some running Saturday being the main day with food, and Sunday taking down and putting it all away, so 31st August, 1st September and 2nd September was selected. We were blessed with wonderful weather, thank you again who preyed for this, my knees still has callouses even now. I think in hind sight the biggest decision we had to make was what would we charge the members to supply a supper, what could we do which was “Good and Wholesome”, and could be easily prepared and served. We had a sort of dummy run at The Hockwold Country Fair, and again the ladies stepped up to the plate, we had 18 members at this show and prepared the food, we felt would work, this was made at home and bought along and we all sat down to lunch in the sunshine, a “Ham salad with all the trimmings, including Hot Baked Potato” and this was followed by a Fruit salad with cream, Wow!! And the surprise was a “Pimm’s” drink, what a revelation. The menu was set in stone, and we could do all this for £6.00 per head. When we discussed numbers, it started with 70 members and wives 140 people, but as time went on it ended up as 80 people. So, some maths was needed we kept all the bills for the 18 original meals and simply arrived at enough for 80. As it worked out we were able to supply everyone with what they wanted with very little waste. It was decided that paper plates were not what we wanted to use, so all the Brandon charity shops were given an order for 100 china plates and 100 china bowls for no more than 5p each, and this was achieved. Knives, forks and spoons was a different matter and thankfully everyone bought along their own, so once again thank you every one. Another potential problem was going to be chairs, we had some but not 80, but we were able to borrow them from the Weeting Rally Committee, so thanks to them also. You can see it that it did not just happen. But again ladies stepped up to the plate/serving tables and when service started, we were sitting down to our supper within half an hour. Thanks, once again to all you lovely ladies and not to forget the gentlemen too. Thank you all. The weekend was suddenly upon us, the orders had been placed, the shopping done, three large trollies worth, it was time to start erecting the three marques, 15 tables in the two big marques and 80 seats, just not possible, we could only manage 79, but there were a few members who were unable to attend. 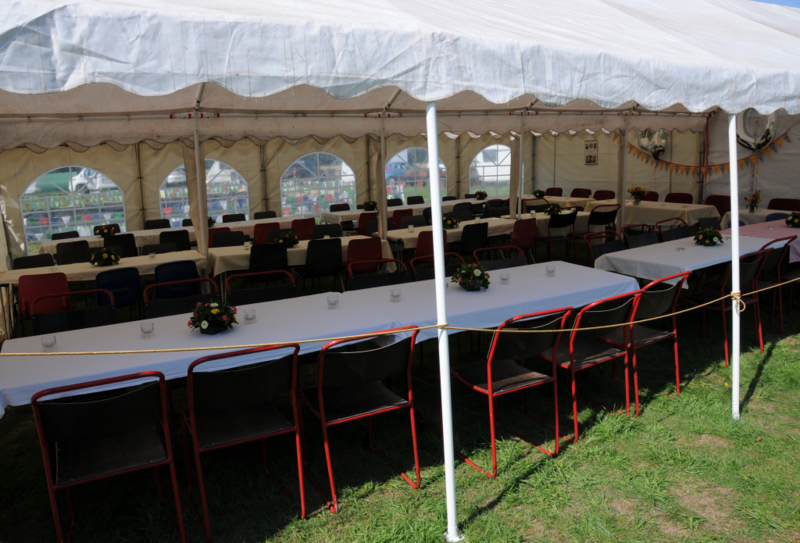 This was Thursday and Friday, the small marque was to be the food tent and the urn was set up here along with the beer and we just about had enough table area to put every thing neatly and in their correct place. Opposite, we had the Big Bears Bash, an inspiration, I am sure I have seen that bear somewhere before? 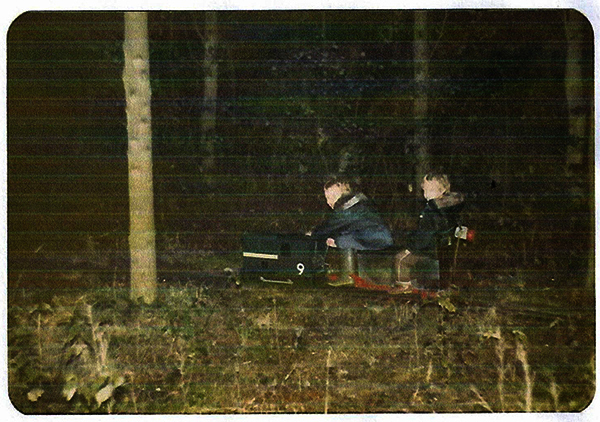 the music was just right and unbelievably it was ran from 12– volt batteries. Well done here again and thank you very much. Saturday arrived, and it was 8am and suddenly it was 12.30pm and cake time, we must have had a slice of every conceivable cake known to man. Lemon drizzle, bread pudding, chocolate cake, you name it we had it. So again thank you, thank you, thank you, to everyone who especially made a cake and thank you to every one who bought in a cake, again, simply wonderful. Cake cleared away and suddenly it was 5pm and time for the raffle, thank you for doing the raffle, great job, I do not think that we have ever sold so many tickets before, but then there was some awesome prizes, and so many, Thanks again. The raffle was taking a while and supper was to be served at 6pm, the potatoes which had been on since 4pm were cooked, thanks again to our BBQ cook, and the food which was prepared at four different locations had arrived, thank you to all the ladies and gentlemen who help prepare it. This was then divided on to the four serving tables, we asked when the raffle had finished for everyone to find a seat at a table and the Pimm’s was served. 6pm arrived and we started serving, and well everything was a blur, but every thing had gone according to plan. “GREAT” Supper finished and we had some speeches, three presentations and the cabaret. Can anyone remember the punch line? Sunday arrived and it was tidy up time, each marque was taken down and put away, so that we can use any one of them individually and we know all the parts are together, so again thank you for all this, as we had the BBQ’s still, we were treated to a Bacon Buttie with tea and coffee and cake if you wanted. 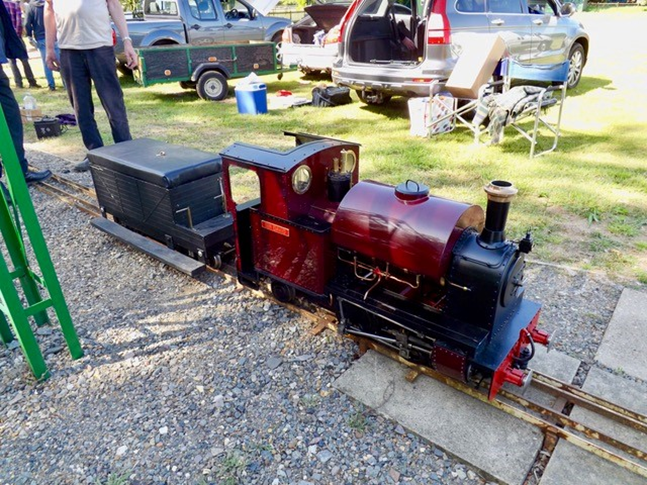 We left the field with one member taking 20 bags of rubbish, thanks to you “Sir” and during the day we had a former member, the very first Treasurer running a 3 1/2” gauge “ Rob Roy” and it thundered round ten to a dozen. The time was 2.30 and we all went home. We were all cream crackered and I certainty do not remember having my supper or going to bed. But we had all done what we set out to do, and were complimented by so many people, all worth every single moment. Thanks, once again to simply everyone who helped us put on a weekend to be remembered. See you all, I hope at the 50th. It is forty years since the Club was founded in 1978, and to celebrate this milestone a special version of our September running day was planned. 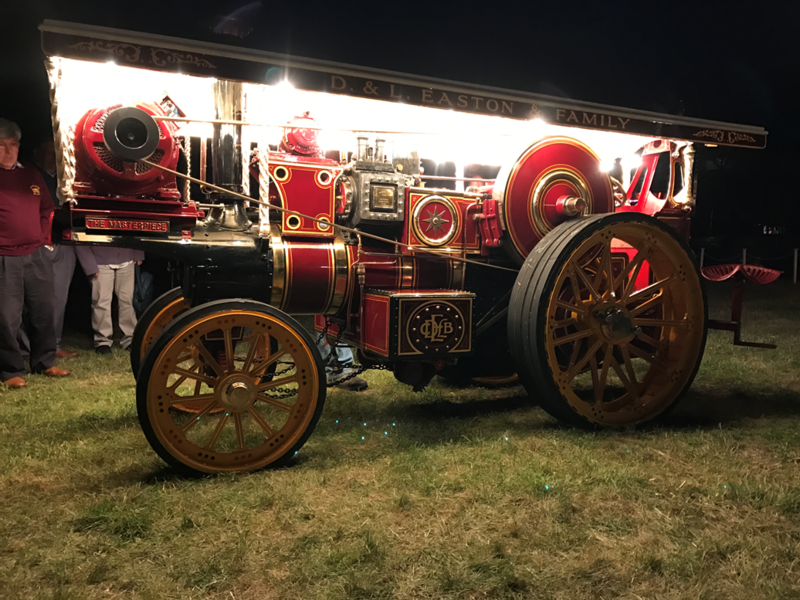 The weekend was to include a road run for traction engines, various games, overnight camping, lots of playing with engines, all culminating in an Anniversary Supper on the Saturday evening. Preparations for this event had been going on for many weeks with lots of effort being put in by the sub-committee as well as other members. I’m glad to say that their considerable efforts were truly worthwhile as this weekend proved to be one of the most successful and enjoyable events the club has ever embarked upon. Friday afternoon saw a group of traction engines and wagons set off for the Saxon pub in the village. Everyone involved enjoyed their run and subsequent stop at the pub, although one engine developed a problem whilst there, which precluded it from carrying on. We hope this issue is remedied soon. The other participants returned to the track well before dark after enjoying a good run with their engines. Saturday dawned bright and sunny with little breeze; perfect! Those who had camped overnight were up and about, with fires lit and engine cleaning begun. More members and engines started to arrive, and soon began to get ready for a day’s steaming. Road steam was well represented. 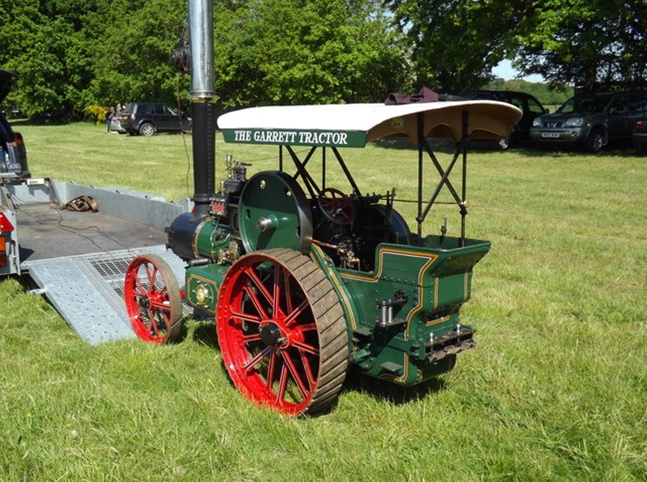 Roger had his delightful 6” Foden tractor and wagon in steam and chugging around. Models of this type of Foden are, like the full size, very rare indeed, and shows how the boiler and overtype engine could be adapted for various needs. A handsome engine that performs very well. Terry Y was steaming his 6” Garrett 4CD tractor “Master Potter”, which is always a delight to see. Steve had his 4” Foden “C” type wagon present and he appeared very relaxed whilst trundling around the site, enjoying his engine in the fine weather. The wagon’s flat bed also proves a very handy perch when it is parked, allowing people to stop and natter in comfort; ideal! 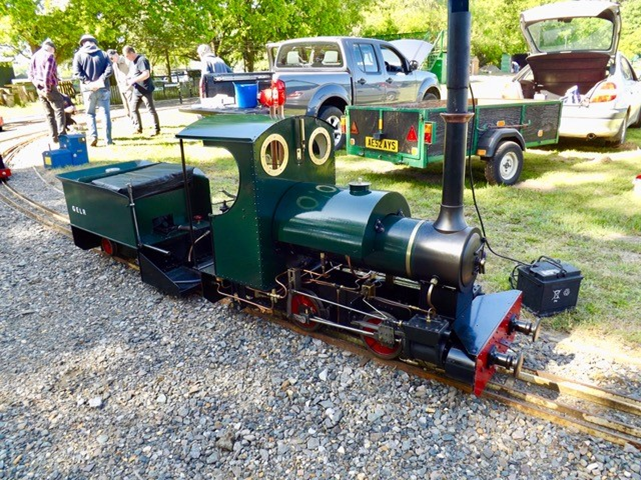 Terry B and daughter Jenny B had brought along their 4” Foster agricultural and 4” McLaren road loco. Both very well built engines, they were a great addition to the road steam contingent. 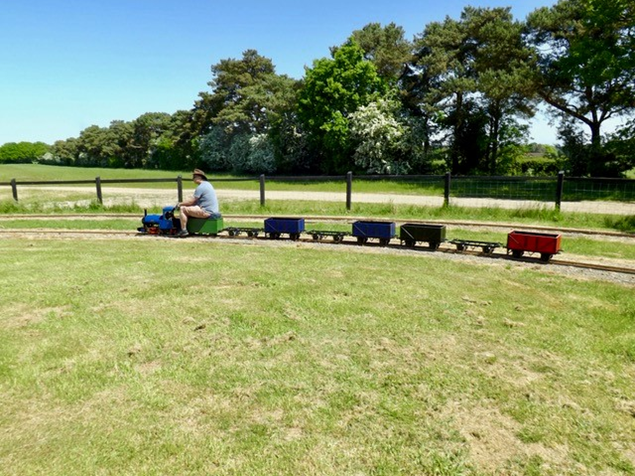 Geoff B was once again doing his best to wear-out his excellent 3” Burrell agricultural and road train, taking long circumnavigations of the field. Again this engine was beautifully turned-out and is a joy to see. Chris’s 3” Minnie “Scallywag” was in steam, and I was able to have a close look at this engine. Built from his own patterns and castings, it shows what you can achieve when you put your mind to it. Apart from the high quality engineering that went into it, the engine also has other neatly fashioned features such as the Firehole and smokebox doors. 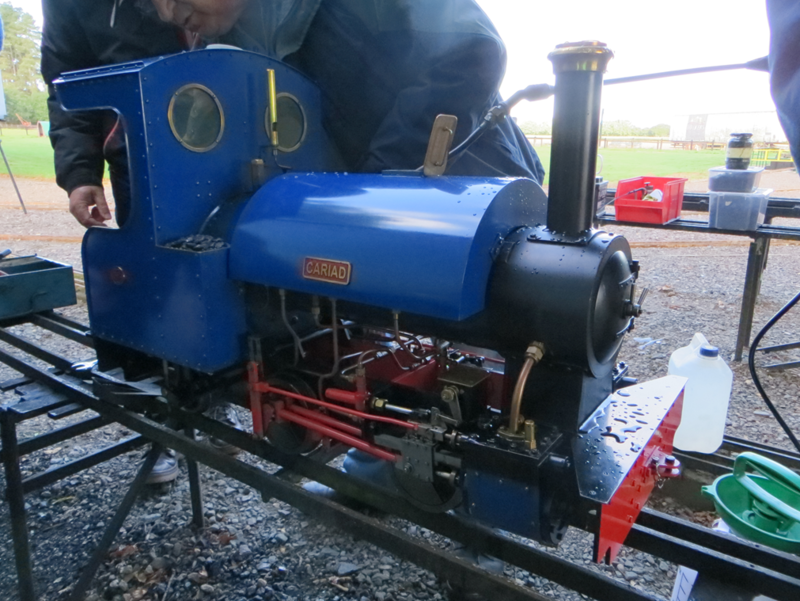 Peter G had his fine 1 ½” Burrell in steam and was exhibiting great skill in running this little engine. 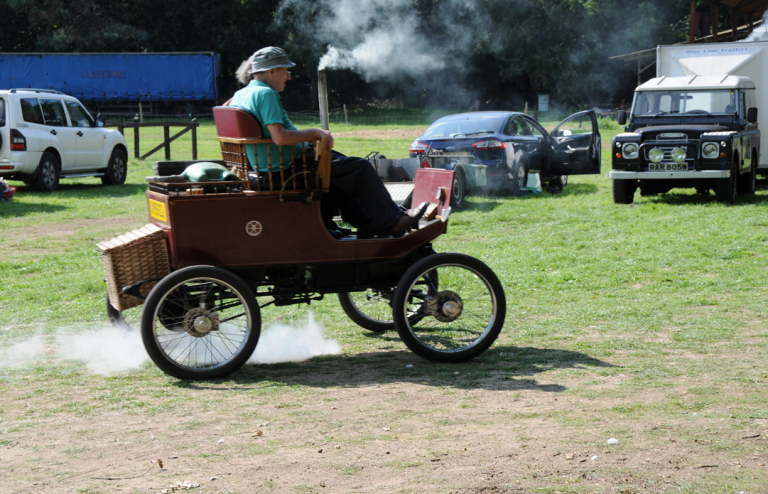 Ray has his steam car running around and was giving rides to lucky passengers. On the track we saw some of our “pod” of Sweet Peas. 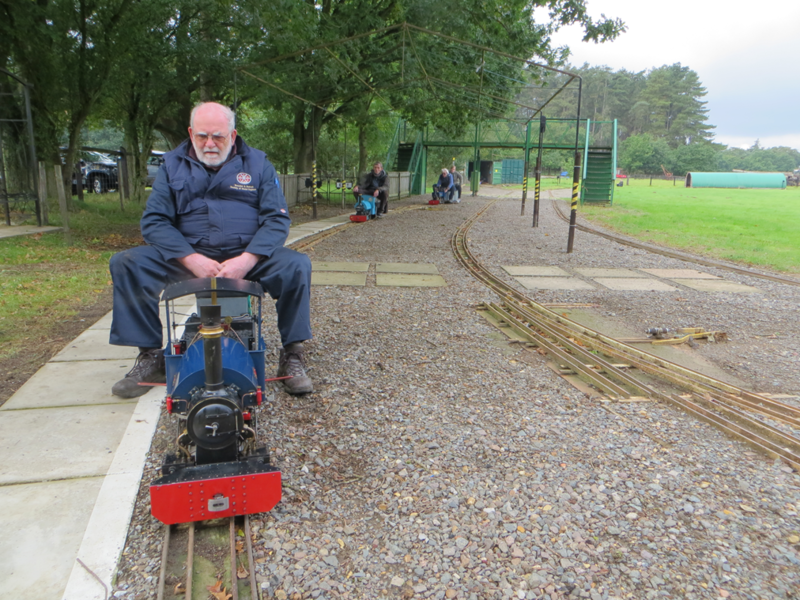 Andy had his 7 ¼” gauge version “Skylark” in steam and hauling passengers, with Peter E taking the controls for part of the afternoon. 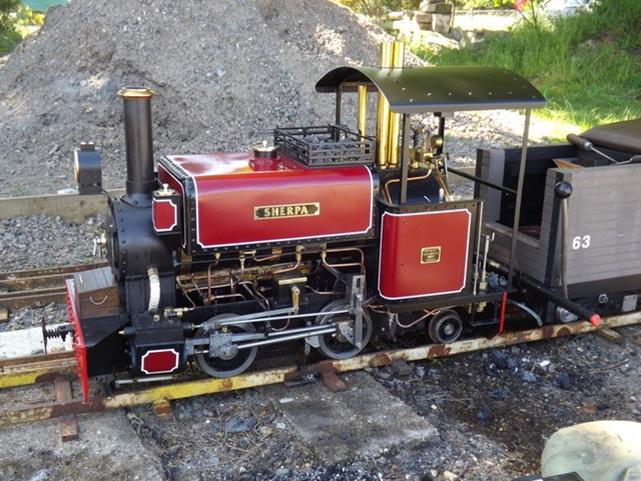 Geoff E had his Darjeeling-inspired 5” gauge version “Sherpa” in steam, still looking superb in lined red livery. Ken had his 5” gauge “Julie” running round, and I can say this engine goes very well, with plenty of power and a good, even exhaust beat. Hugh came with his loco-boiled version and had a good time running around the track. 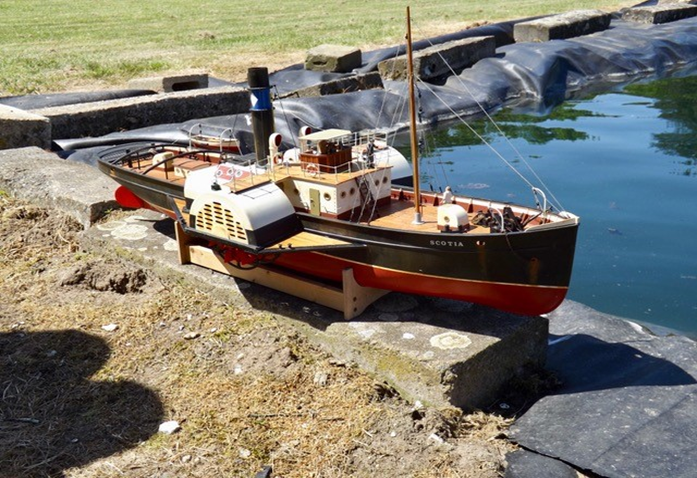 Kev had brought his 3 ½” gauge version “Violet” along, though it was not in steam. Built by life member the late Eric S it was felt that it should be present on the Club’s 40th birthday even if it was simply on display. Paul B had his 5” Simplex in steam and we look forward to Paul having a good crack at the whip with this lovely engine soon. 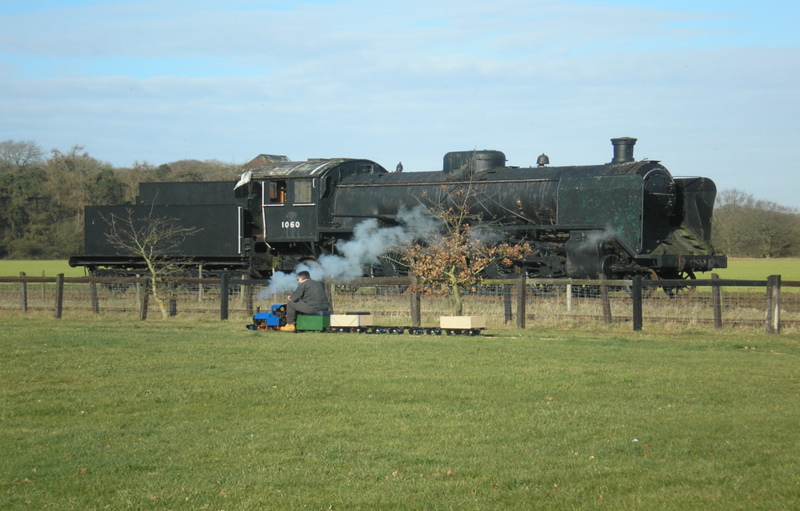 Peter B had his stationary steam plant running for the afternoon, and very pleasant it looked too. This is another engine that was built by Eric S, and runs like a Swiss watch. Jenny’s fiancé Sam had brought his 7 ¼” gauge “King of the Scarlets” for a run and enjoyed lap after lap of the track. 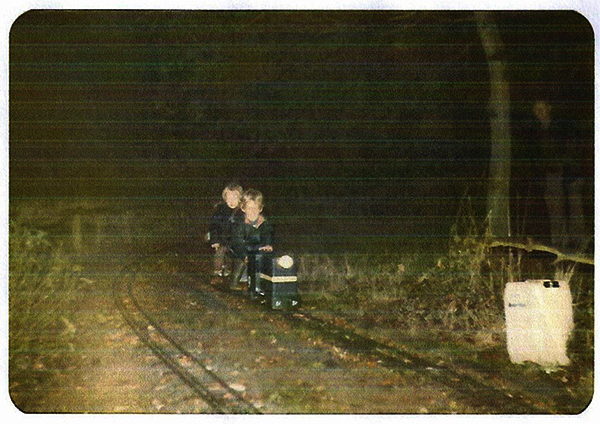 Ralph had his large petrol-hydraulic loco on the track which made for a very fine sight. 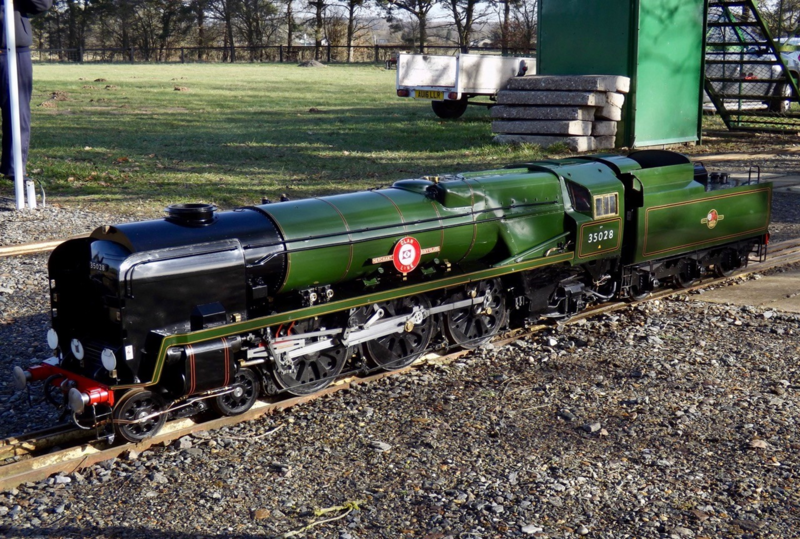 In heavily modified and rebuilt form the loco looks splendid, and drives very nicely indeed. From the comfortable driving position you get the feel of driving a “real” engine, and there is always plenty of power available. On the pond we had a small flotilla of boats. 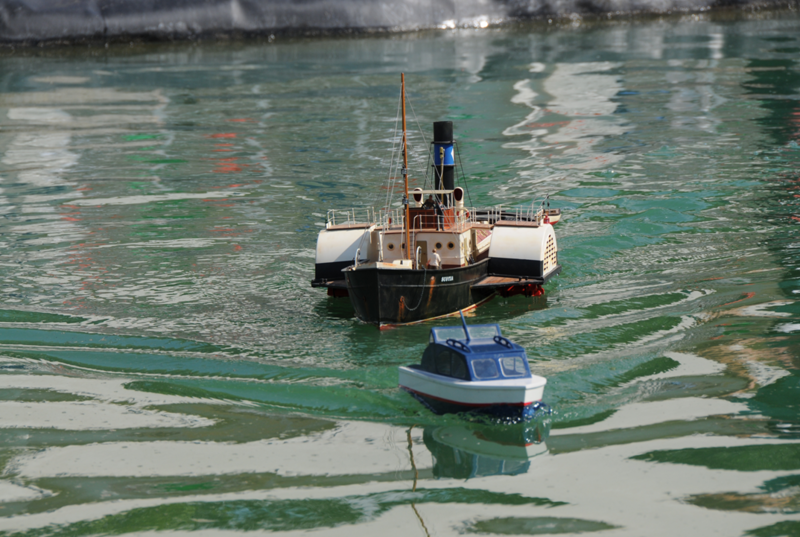 These included Geoff E’s graceful paddle steamer, Sam H’s little river cruiser, and Ralph’s impressive naval gun boat. The latter was patrolling or rather prowling the pond, making sure no pirates were present, whilst also keeping an eye out for the dreadful Kraken! 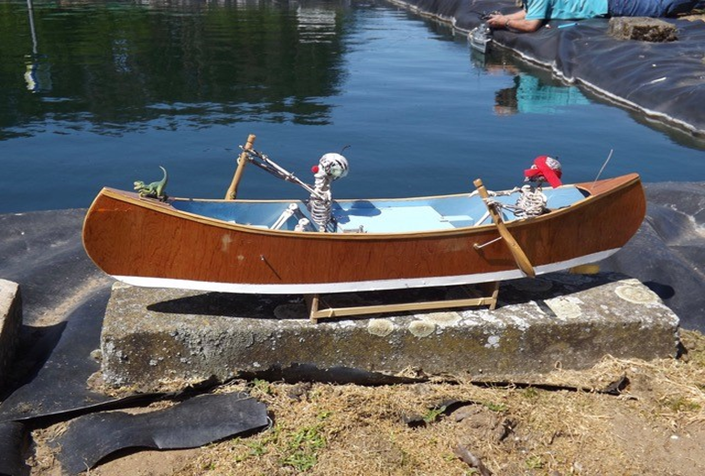 Sadly the Kraken did claim a victim in the shape of Sam’s boat, but this was quickly rectified and his boat once again took to the water in style. Games were available, including trying to burst water balloons with sticks over the heads of the passengers on the trains. This proved to have limited success, with the option of just throwing them proving far more effective! However I don’t think we’re in danger of having any of our members being called-up to the England cricket team anytime soon, such was the quality of throwing on display! We were lucky to have 8nhp Burrell showman’s “Queen Mary” from the Burrell Museum come along to join the party. Resplendent in its weathered paintwork and shining brass work, this engine was generating lights into the night to the delight of those present. Now we come to the catering department and I’m not sure that words can sufficiently convey the superb quality and excellent service to which we were treated. 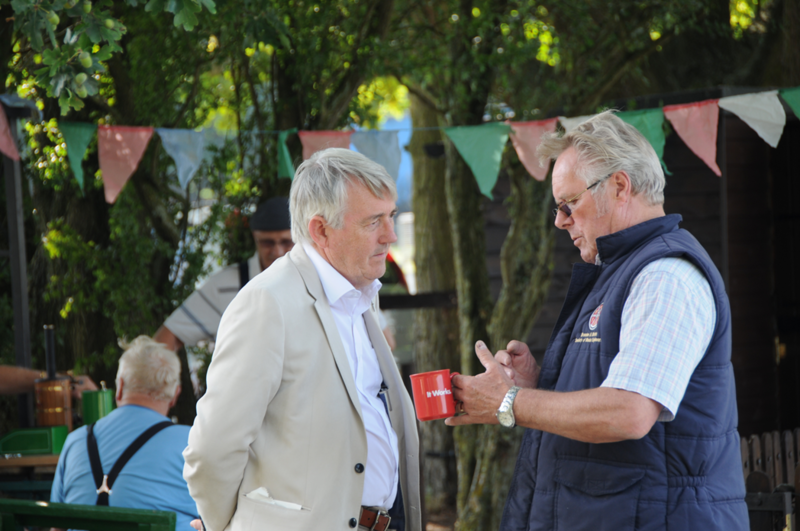 The small marquee housed the refreshments, with hot and cold drinks abundantly available all day, and this added to the relaxed atmosphere of the event. Members had supplied a splendid array of cakes for our early afternoon vittles’, and these were beautifully arranged and served by members and their wives. I confess to trying both bread puddings that were on offer and both were jolly good stuff! Engine playing continued into the afternoon, although some members were busy getting ready for the evening supper. As I’ve already said, preparations for this supper had been going on for many weeks, and today was the day. The two large marquees were beautifully laid-out with tables and chairs, with table cloths and flower displays, candles and bunting. Such was the quality of this display it prompted some of those present to ask “Who’s getting married? !”, as it would be no surprise to see an arrangement of this high quality at any good wedding reception. With some of those attending neatly wearing dinner suits, we were treated to our aperitif of Pimm’s served at our tables. The air of conviviality was punctuated by one of our generous servers inviting us all to go up for our plates. An orderly queue was formed and we collected our meal, served to us once again by some of the members and their wives in a very organised and cheerful fashion. Our splendid supper consisted of freshly baked potatoes, salads, cheeses, baked beans, quiches, cold meats and bread rolls. Carrying our plates back to the “dining tent” we then sat down to enjoy our food and the company of those around us. 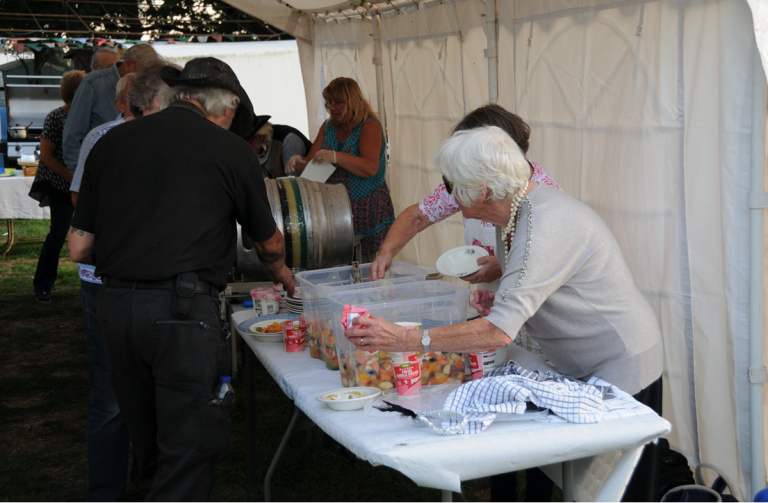 Some had brought wine to have with their dinner, and whilst other beverages were consumed, we were also lucky to have a barrel of Beeston Brewery’s “Worth The Wait” at our disposal. A very tasty brew this proved to be, and many enjoyed a pint or two! At this point I was annoyed that I was not staying overnight, as I would’ve liked to enjoyed a longer sampling session! Dessert of cup cakes with “40th” icing on, and fruit salad with cream came soon after, and all reported themselves completely satisfied and that the meal was excellent. Speeches followed, with thanks being given to all those who had played a part to make this event a truly wonderful and memorable occasion, and one that will live in the Club’s memory for years to come. We acknowledged the absence of Club President Richard, who at this time was in hospital, and we all wished him a speedy recovery. Presentations were made, and then it was on to the intriguingly-titled “cabaret”. What followed was a real treat, with Mick W and Geoff E giving us their rendition of how the Battle of Trafalgar would’ve been fought today. With Mick playing Nelson, and Geoff playing Hardy, we were given a very humorous insight into the differences between now and 1805. Poor Nelson was becoming quite frustrated at the encroachment of Health and Safety into the Navy, with such surprises as the crow’s nest being out of bounds as it is too high, the rum ration being abolished, and sails cannot be set unless the crew are wearing harnesses, full body protection and hard hats! However, Nelson did have a crumb of comfort when he discovered that at least one activity was still alive and well in the British Navy! A brilliant performance by these two members, and we hope to see them perform together again, so keep an eye out for them at your local Panto at Christmas! After this most enjoyable dinner, the clear-up commenced, and dirty plates and platters were being boxed-up ready for washing up. Once again we are all so grateful to those who attended to this task. 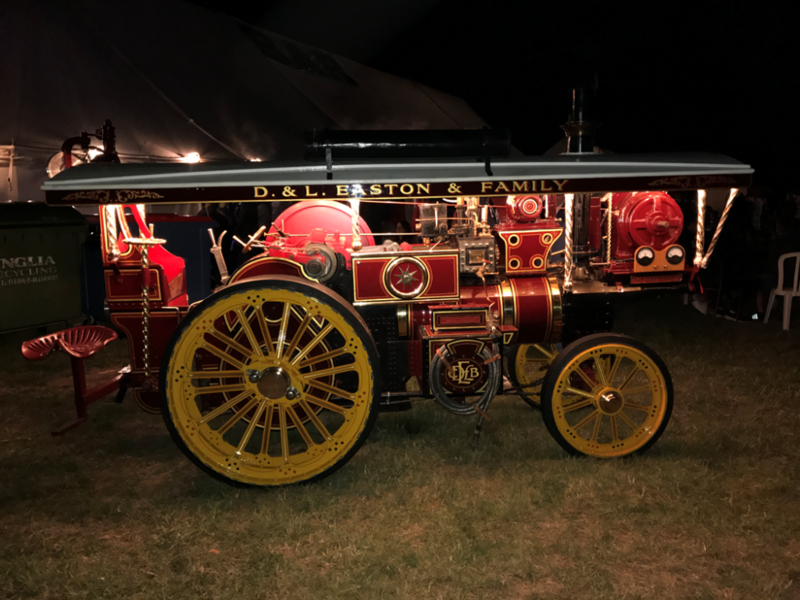 With some members heading home, some members settled down to an evening basking in to the glow of the showman’s engine, having had an absolutely wonderful day. The clear up continued the following day. I just hope that barrel of beer was found to be well and truly empty by the morning! Our thanks go to the generosity and dedication of those members and wives who made this event happen, and ensured that we celebrated the Club’s 40th birthday in most the memorable style. A piece by our own Kevin B, thanks Kevin, glad that all the hassle and hard work turned out so well. Terry W, and Engine, Ray R , and Roy B. If he was to cast his net NOW? The Boating pool is a live with the sound of BOATS. Every one seems to be having a good time? I suppose it had to happen, and well, now it has, the old ticket office has had its day. It was probably too hot this year, but the gallant ladies stuck it out and we probably sold more tickets this year than we have ever sold before. A new ticket office was required, no sooner than the message was received, a new ticket office appeared, with one or two alterations the ticket office now faces the public, and if the ticket ladies want to see the trains running the entrance door has be made like a stable door, top open if required, we have room for a coat rake and there is a mirror, if the ladies need to adjust their hair or make up before leaving the office? well you never know. We have started ballasting the area around the Ticket Office as the grass never grows here because of the trees, so from about the exit gate on the station right down to the Club hut will be ballasted as we have the track, this work is on going, and as yet is not finished. Ongoing work at the track. 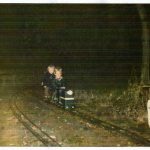 As in my report on page one, we have installed new cables for out new Digital signal system, the cables have been laid and Mike H and Paul B have installed the new box and changed the positions of some of the electrical switches which were in the same area. We have installed all the cables into the box, but will run our “Halloween” day before we change the cables in the boxes under the Bridge and on the gantry. It is looking “very good” so come and have a look. Summer is here at last. The Weeting Rally is only three weeks away. Please do not forget that Saturday 14th July is setting up day for the rally and we need all hands on deck/track. 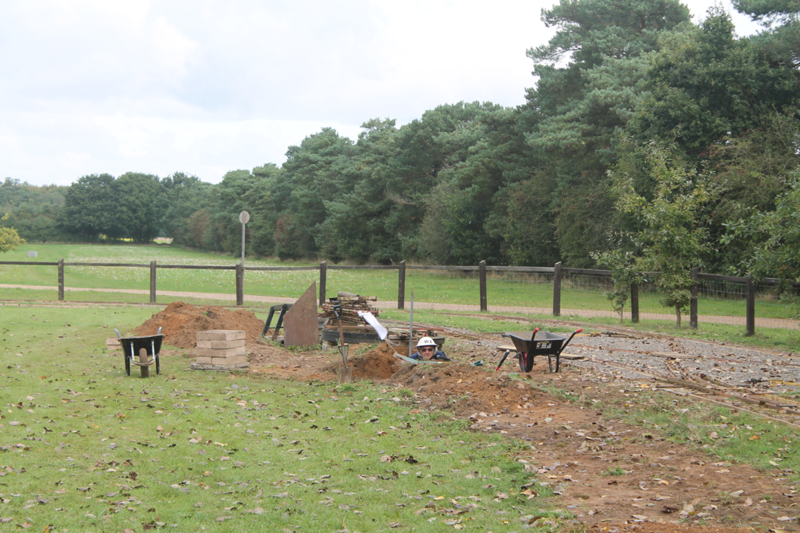 The track is finished and the pond has been pumped out, so we are waiting for the water to refurbish it. Every thing is on track for a good rally, lets hope the weather holds. As you will see from your tickets the Weeting rally committee are asking for some fancy dress dating back to the 1970’s for the Rally Sunday, so if you have your old 1970’s suite or dress in the attic feel free to give it an airing. The newsletter is a bit late this time, my fault not the editors, I have had a lot of work this month. One more important thing, we need help on all rally days, so please let us know what you can do. We need cakes etc. for Saturdays tea at the Rally, OK two things, but lets hope for a good rally. Also remember Wednesday meeting at The Ram on the 4th July. Where does the time go? Here we are nearly the end of June and getting ready for The Weeting Rally. We have had our first family day and this was very good, lots of Loco’s, I think someone said at one time we had 10 on the track. The weather was great and it all went very well. 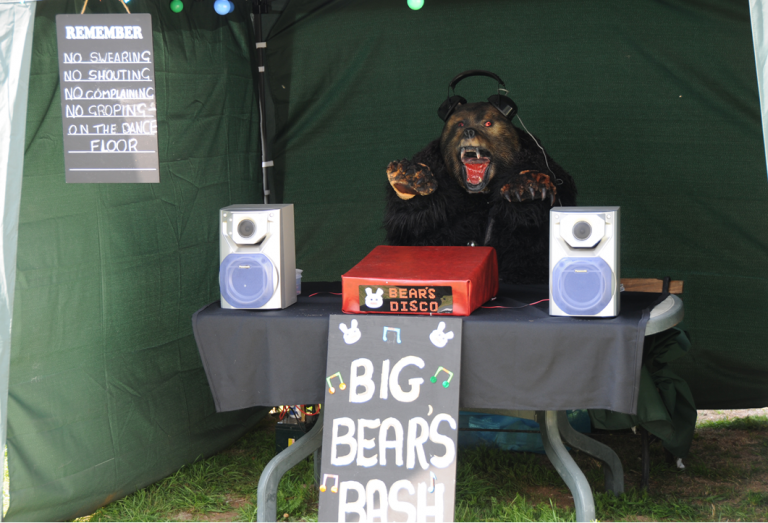 We have had Hockwold Fair, and this also went very well, a l-o-n-g day but well worth it. 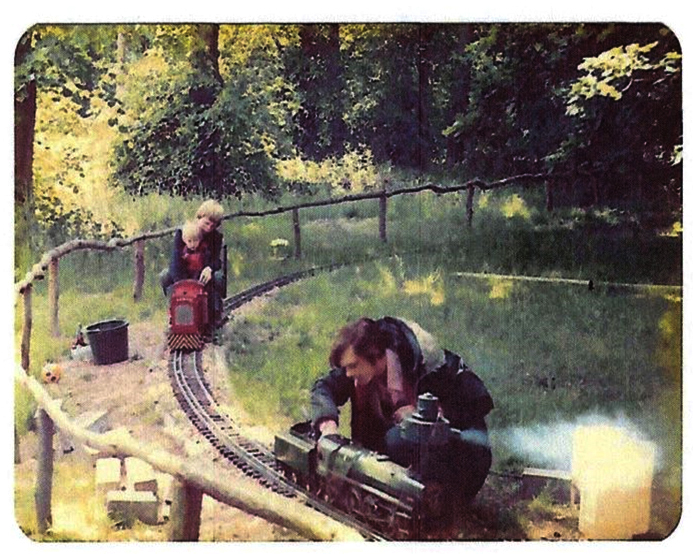 We have had a couple of mentions in the “Model Engineer” and from this last issue we have our meetings entered in the diary part of the magazine. The track is in great fettle even though the mole’s are trying their best to thwart us, but we are dealing with them. 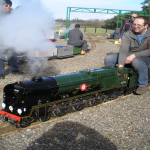 There is now a big push to get every thing ready for Weeting and I am sure this will arrive very very quickly, So hope to see you all then, It’s a “Barry Potter” theme? We were certainly blessed with very nice weather on Saturday May 19th. Lots of models see pictures and we had some new members wanting to join the club. The track ran superbly, seeing the number of engines going round made one think of all the hard work that has been done in the last couple of years, and how worth while this has been. To see Ken W Sweet pea pulling Kevin B trucks was certainly a sight to tell everyone what the club is all about. Geoff E “Sherpa” had an unfortunate blow out, but this was soon fixed and he with his granddaughter were soon trundling round. 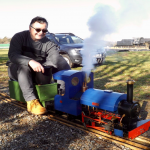 Our youngest member Sam H must have done miles this day with his very neat electric loco, well done Sam! 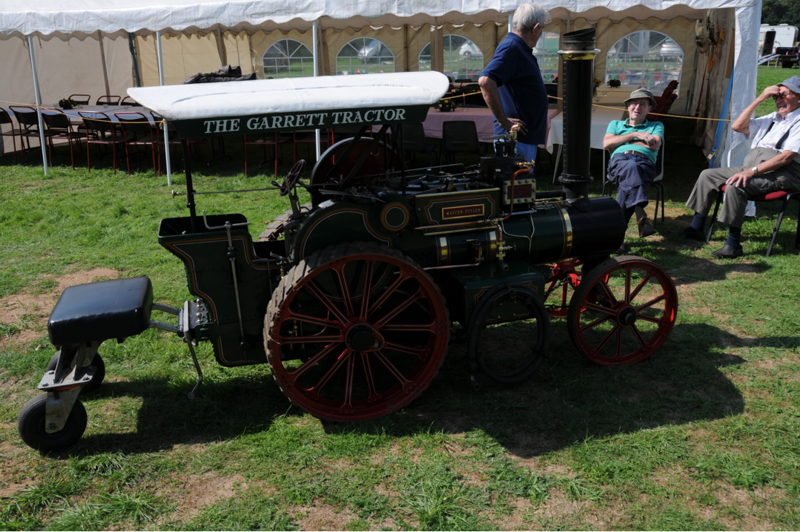 Geoff B had his award winning Traction engine with trailer and water carrier running. Peter E big Burrell traction engine going on some long “hikes” probably not the right word, perhaps “Runs” is better, I am sure you will tell me. 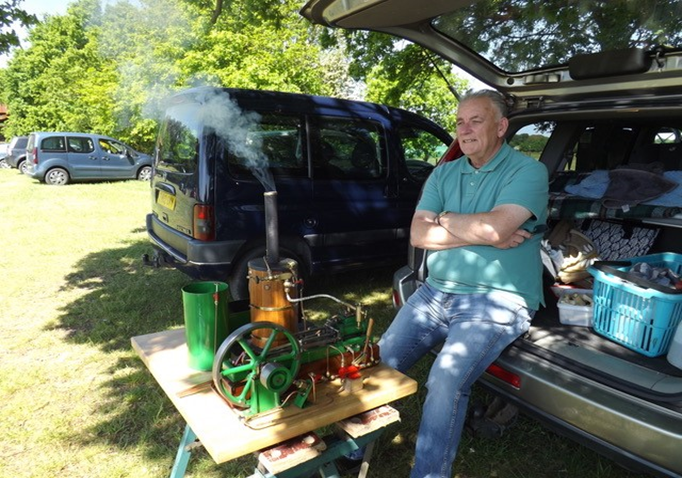 Peter B had his stationary engine running, and all in all it was very well represented. Ray R with his “Locomobile” Chris H and his “sorry Chris” “Fut Fut” very neat and very nice; I think there was a very nice comment on the You Tube video about it. Hugh S had his “Lion” running and it run very well. We had a first with Norman H superb “ Edward Thomas” this certainly looked a powerful engine, and it looked good and performed well too. Well done. Paul B had his “Simplex but alas another problem keeps Paul off the running track. Andy G had another successful day with his “Sweet William” he also must have covered miles. We had no less than 5 different boats, well not all boats not even ships but a lovely display. Peter B skeleton canoe, Ralph R warship and MTB, Geoff E paddle steamer complete with all the “rust “ one could imagine. 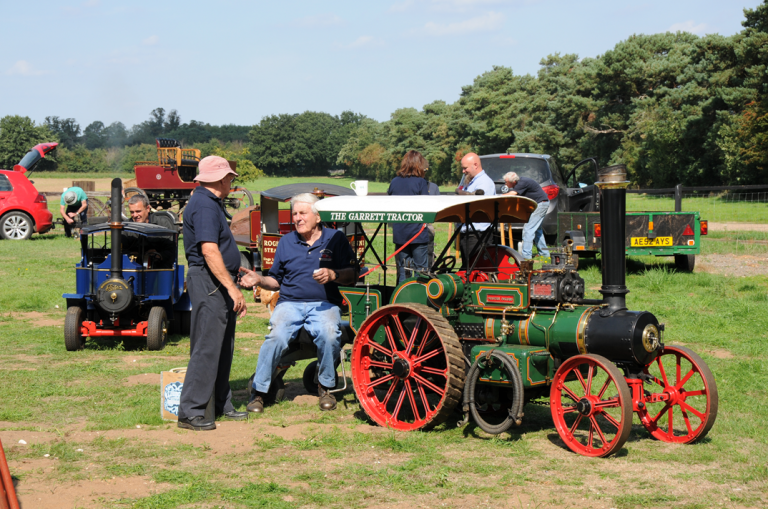 Two more large Traction Engines, Terry Y and Norman S both looking and running superbly. We all had a fish and chip lunch, well almost every one, we had a slight slip up with the number of Sausage and Chips, perhaps another day we can organise before hand – any way I hope it did not spoil the day and you all went home having seen the fun side and the hard working side of our club. Well here we are and it’s June! 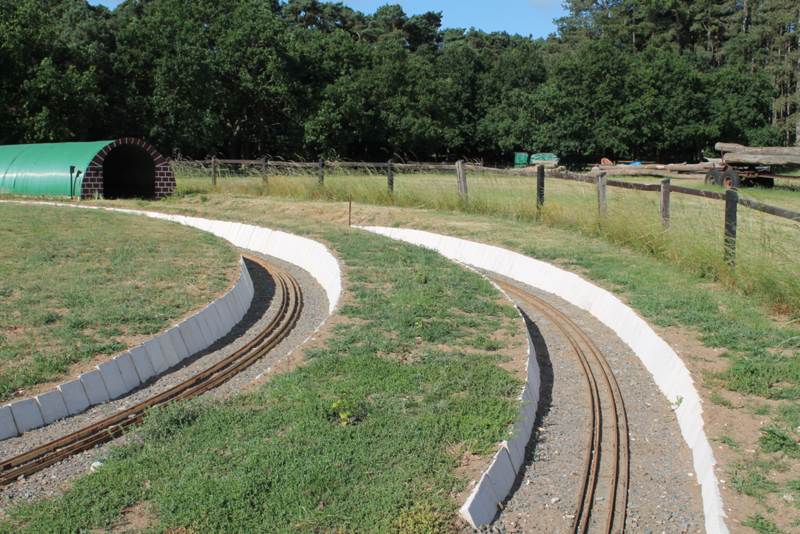 The track ballasting has been finished and we have laid nearly 1000 25kilo blocks around the top cuttings and it looks rather special. 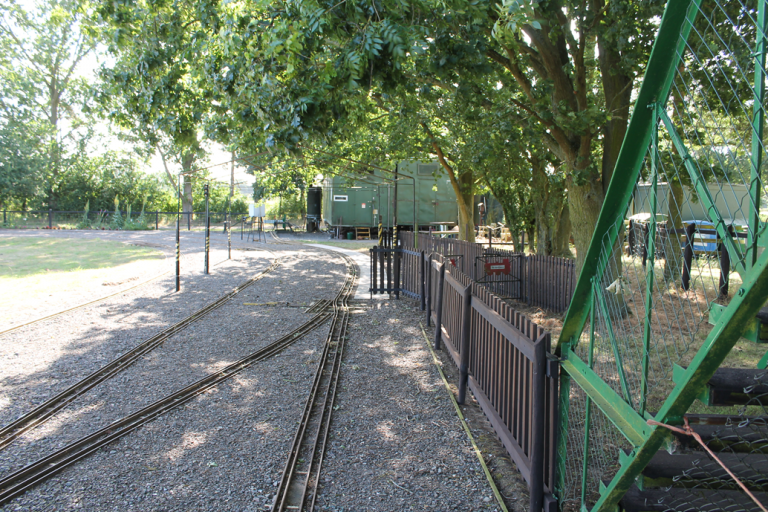 We have laid almost 120 tons of ballast, each barrow load shovelled in to the barrow and handled from the heap to it point of use – no mean feat. We have estimated that during the two plus years we have been doing the job we have notched up 6500hours of work, but worth every minute. We have replaced all the old contacts around the track with new stainless ones and have placed new cables in places to try and space the loco around the track; we are still wrestling with the loco’s switching the signals correctly but we are getting there. 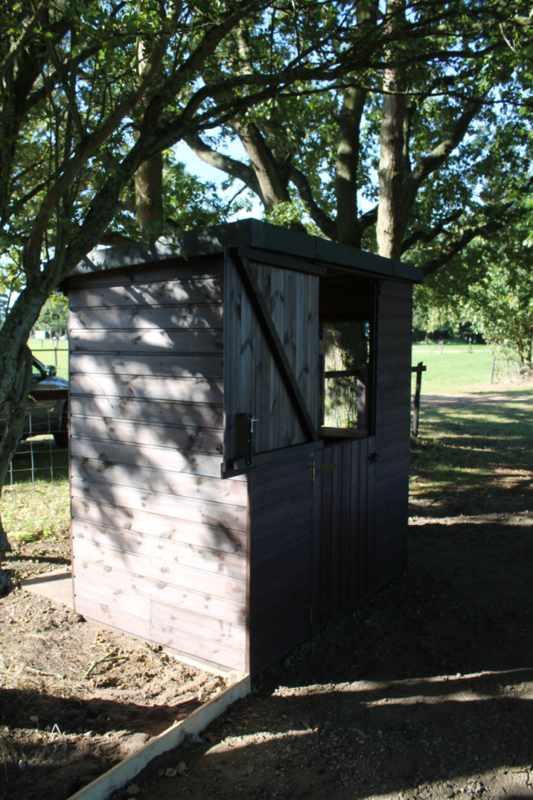 We have dragged the Gents toilet into the 21st century and added glass windows and net curtains in both toilets – next time you use our facilities, let us know what you think, nice or horrid, we have thick skins. 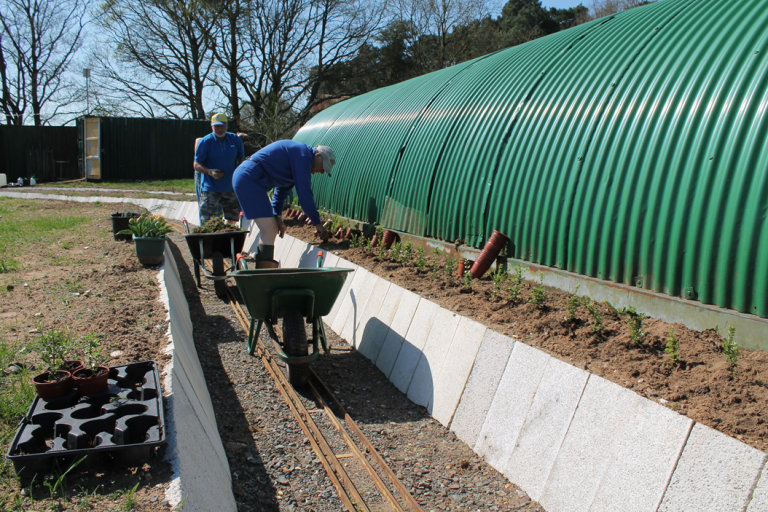 We have continued to plant shrubs and plants around the site, with the addition of a small hedge the full length of the tunnel and the centre ground leading to the tunnel with have planted a row of “fuchsia” plants so look out for all these additions. Begonias and Geraniums have been added to the small garden at the Gantry end and the foxgloves are looking great. The moles are still causing a small problem but our chief mole catcher is doing an admirable job. The grass is looking superb and we have recently emptied the pond in preparation for new cleaner safe water. We have sprayed the track with weed killer and are keeping the weeds at bay, so all in all it is looking superb. The fencing at the station has been “creosoted “ and so has the wooden steps and timber on the bridge. 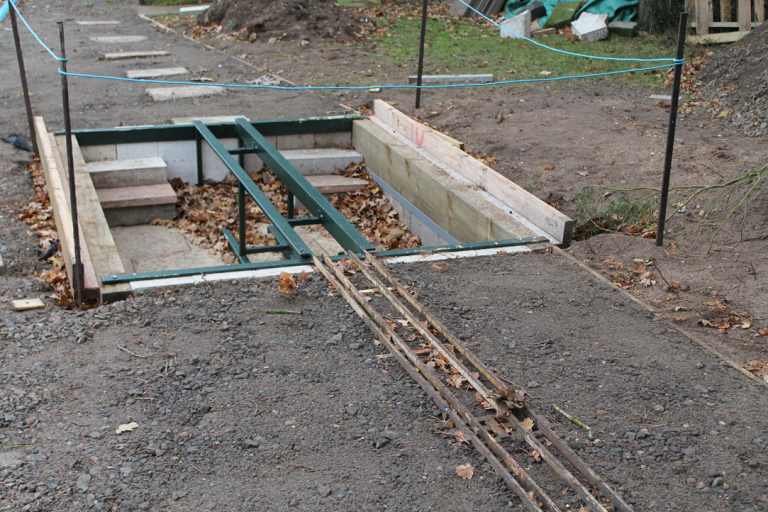 Things still need to be done – we have to finish the Ash pit under the rails at the turn table. So we are still at the track Tuesday, Thursday and Saturday morning from about 9am, so if you would like to help and participate in some good tea and coffee and sometimes cake and banter, then it is the place to be on the said days above. Below are some up to date pictures. Following the dry run at Hockwold Show, we have now been able to fix a price for the Anniversary Supper and this will be the princely sum of £6.00. 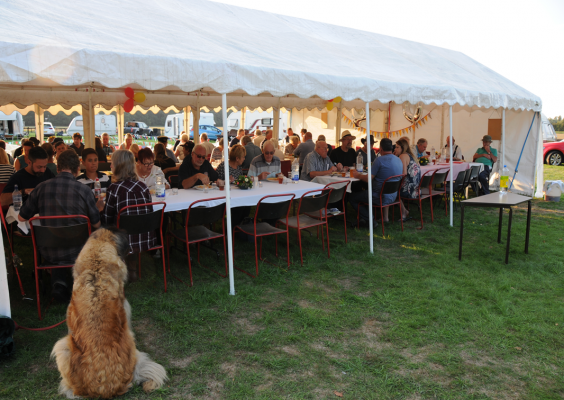 The meal will be a cold meat salad meal with a Baked Potato; a “Pimms” drink to welcome you into the Marquee where we hope to sit you all down to the meal; the cold meat salad will be followed by a “Fruit salad”. We will be able to do cold soft drinks, but if you want to drink wine then please bring this – there will be no corkage. We hope to have a barrel of beer and this will be charged. As we will not have enough chairs, we ask you to all bring along a fold up chair. We will be having china plates and bowls for sweet, but could you all bring your own knife, Fork and Spoon, as the £6.00 does not allow for the purchase of these. Much discussion is going on at what music we can provide, and we hope there will be somewhere to dance, if that is what you want to do. 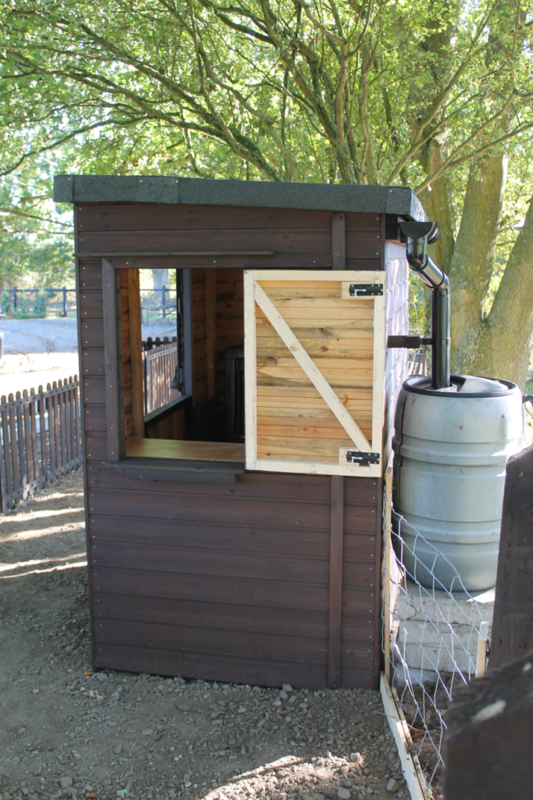 We will hire two toilets for the week-end and hope these will cope. This is a ticketed meal and tickets will be on sale from 1st July 2018. Well here we are again, near to the end of April, soon to be May. Well, what has been happening, the sun has started to shine, there is a lull in the rain, so lets hope summer will soon be here. 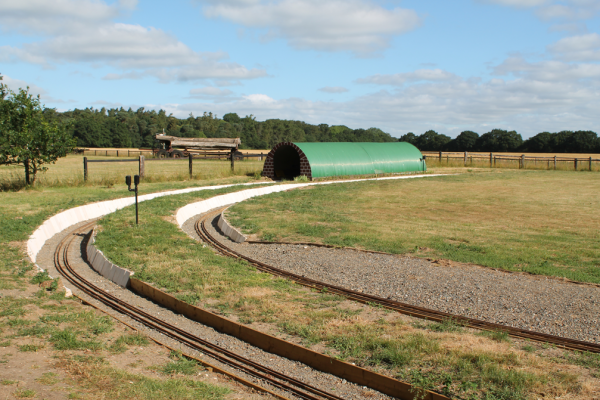 The work on the track has nearly finished, the new signal contacts are about to be fitted, the water tank has been repaired, the grass has had its first cut, and the weeds are about to receive a good dose of weed killer, so all in all the track is looking very good. We now have six new members and three junior members, so the club is growing. Paul B Andy G and myself have just attended a Boiler seminar, we now have the latest updates, so we should be able to keep things to where they should be. 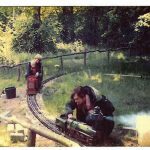 The Doncaster Model Engineering show is 11th 12th 13th May, so if you want a good day out go and have a look. My own engine has started to take shape, so things are looking up. Lets all look forward to the rest of the season and enjoy it. Bye for now. Dave Moore Chairman. 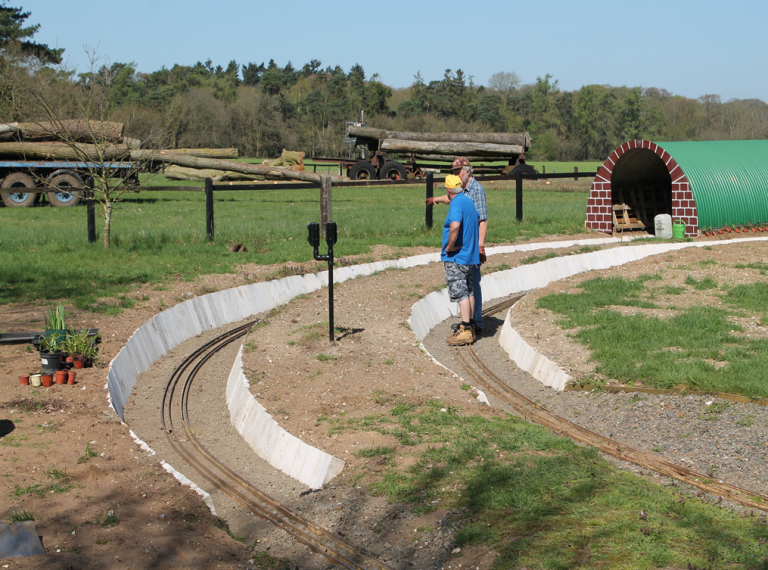 April has nearly gone, The ballasting of the track is nearly finished all the block work is done but we need to just finish both tracks from the end of the blocks to about level with the ladies toilets. We have worked in all weathers since November when the blocks arrived, we have some new contacts to do and a small amount of re- wiring for the signals, some painting and track tidying, so see you Tuesdays Thursdays or Saturdays. 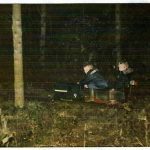 We have already had our first sub committee on the 40th Anniversary, see report in these pages, we hope to have a theme for The Weeting Rally, more on that as it become more concrete . 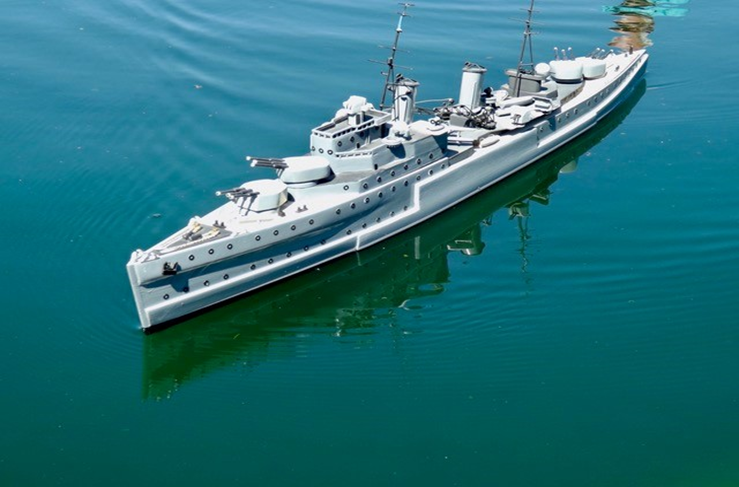 There is the Doncaster Model Exhibition to look forward to. There is I hope some exciting news on the Loco front, they seem to be breeding like “rabbits” watch this space. The Hockwold Country Fair, is now closed and we look forward to this show. Our NEXT meeting May 2nd is our AUCTION Night so please bring your unwanted unloved items and see if someone else will cherish them, and in to mean time it will add a few pounds to club funds. This year is full of Anniversaries. 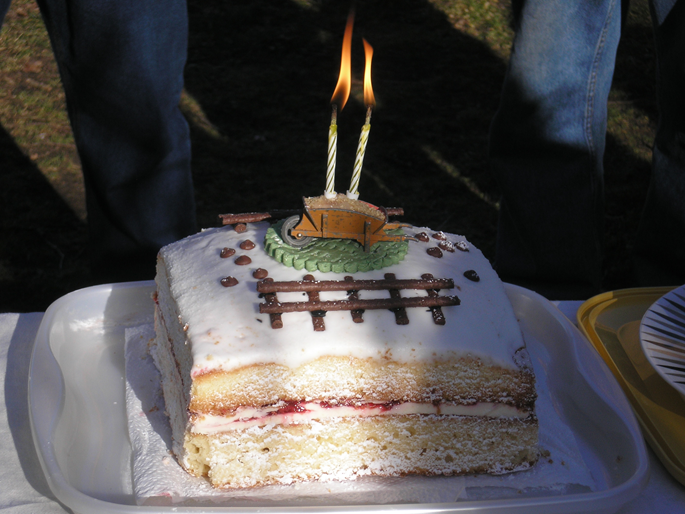 Not only is the Club celebrating its Ruby Anniversary, but this day also marked two years since the extensive track work scheme began. 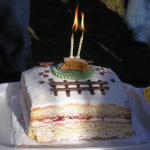 To mark this date a running day was held at the track, together with a terrific buffet of glorious cakes! We were truly blessed with excellent weather, with clear blue skies coupled with “not as cold as expected temperatures”. 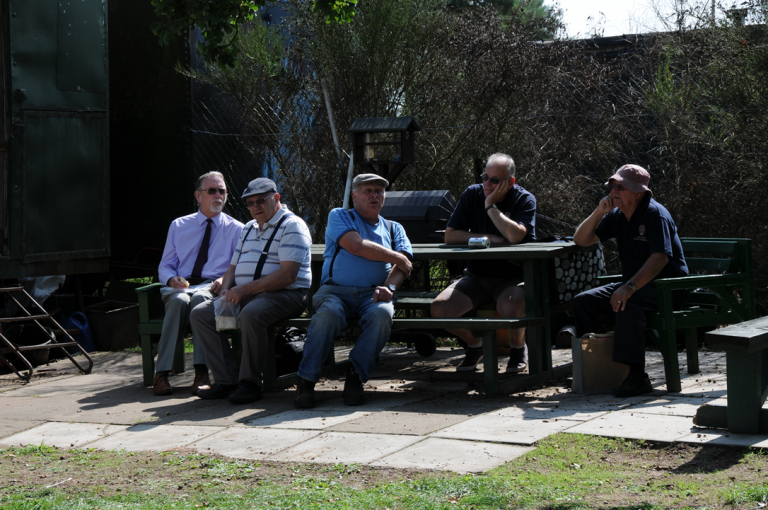 It was nice to see so many members come along to enjoy this day. Members turned out with various engines and toys to play with. Chris H came along with various r/c machines for air and sea. His “Flying Pizza tray” was zooming around the skies , and his model boat was making waves on the pond. Two 5” Sweet Peas were in steam and looking very fine indeed. 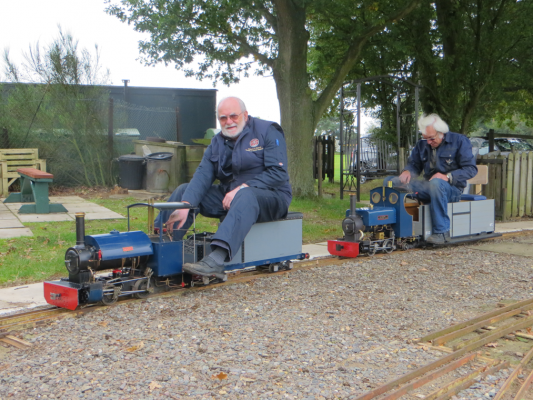 Ken W used his to pull a freight train combination of Geoff E’s bogie wagon and Kev’s work –in progress wagons. It was nice to see trains going round the track, and nice to hear the distinct sounds the wheels made on the track joints. Geoff E had his new-look Sweet pea “ Sherpa” in steam, looking resplendent in its new livery and Darjeeling Railway type adornments. 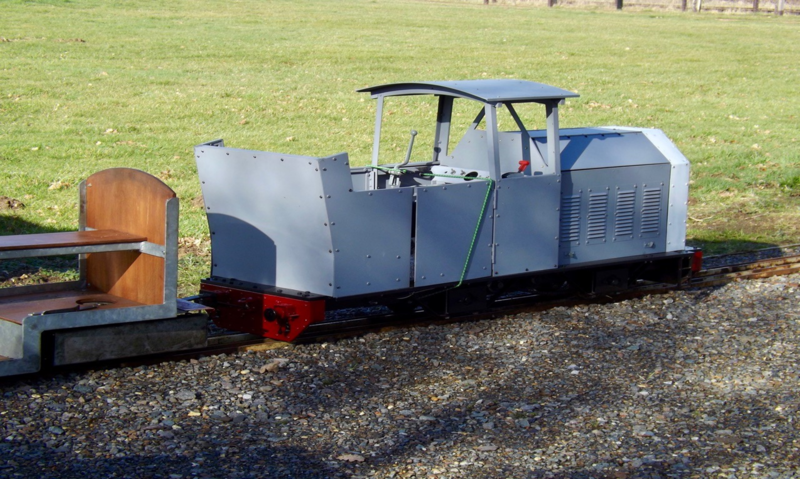 Ralph R had his big petrol loco complete with bodywork on the track. 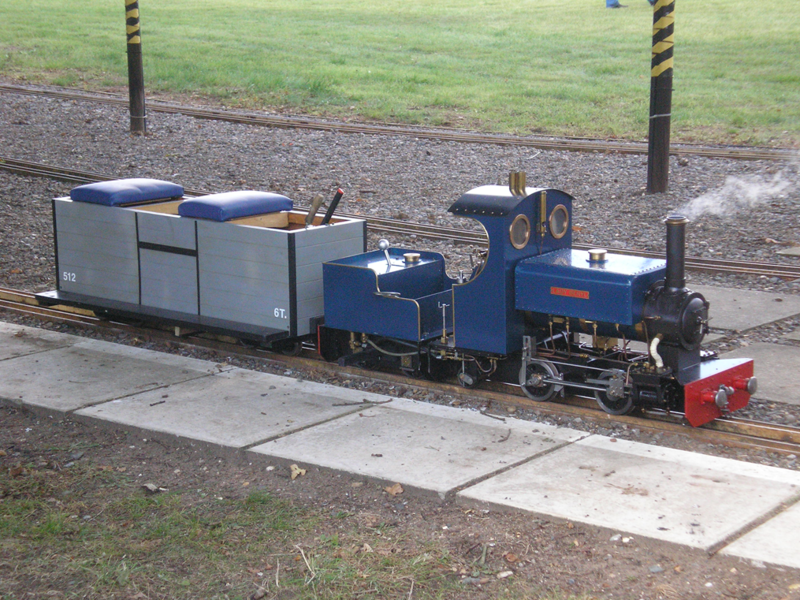 An interesting sit-in loco, we are sure that it has enough grunt to pull a house down! Great! 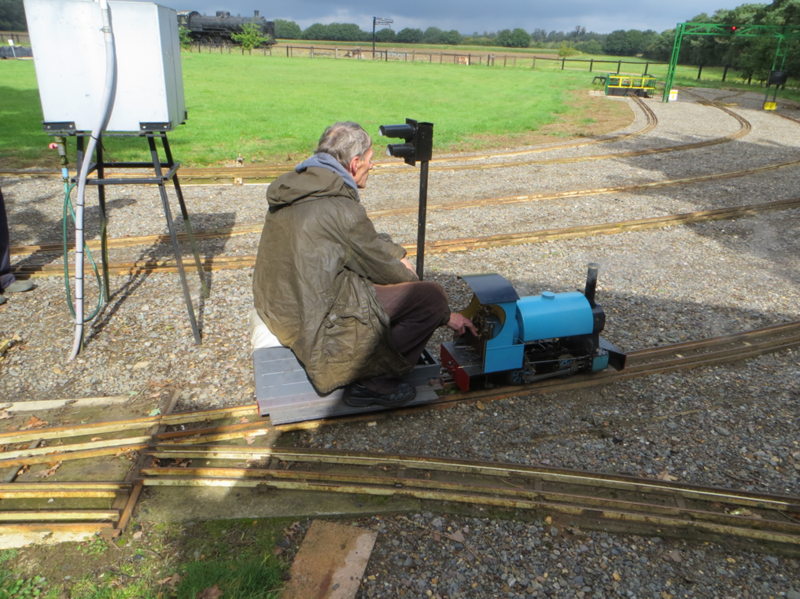 Sam H was making several laps of the track with his 5” electric loco and enjoying every minute of it. 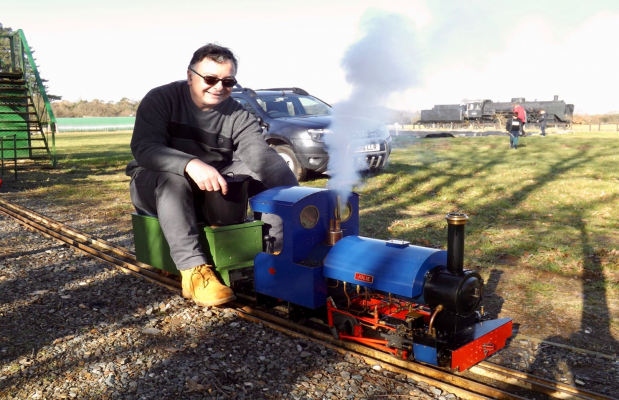 Stuart F had a 5” electric and freight train which looked great in the bright winter sunshine. Peter and Dave T had come along to road test a 7 1/4” Bullied Pacific they were fettling. A stunning loco and a delight to examine. 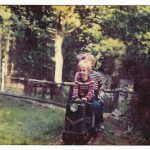 You get the feeling that given a railway of about a mile long and a good heavy train you could have hours of fun with this machine. An absolute delight! Ray R had brought along one of his stationary i/c engines which ran very well and caused a lot of interest. 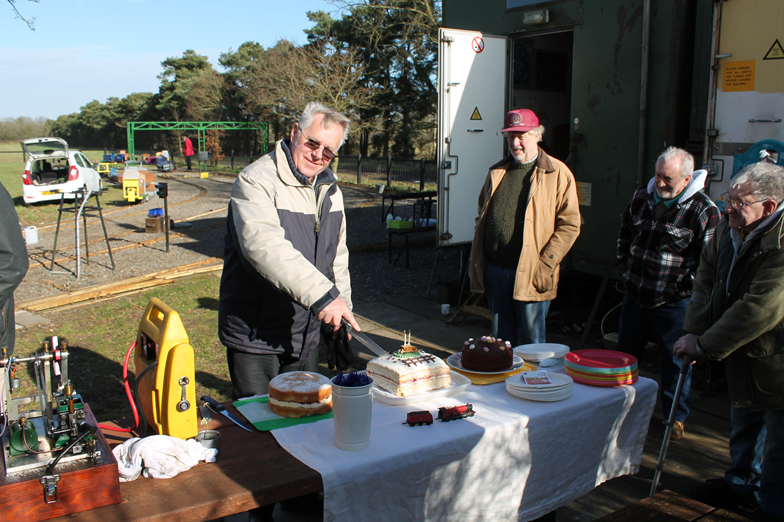 We also had a couple of our older members present, nice to talk to Roy B and Rod C. BUT, surely the stars of today’s show were the three cakes that were brought out for all to enjoy. The work of some members and their wives and partners, they were absolutely splendid and were complete with candles, a railway loco and a miniature wheelbarrow in honour of the role these tools played in the tremendous work that has been put in to improve the track and make it look so good. They were all delicious and despite the large quantity presented, there was very very little left at the end, a testament to their tastiness!!! Many thanks to the chefs, their apprentices, and all those who came along to make the day so much fun. 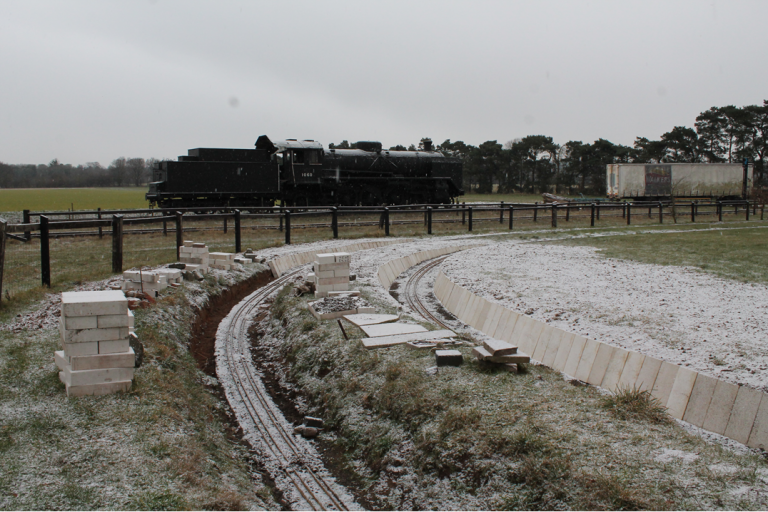 I can now report that we have finished laying the blocks around the top two curves, from the Finnish Engine round to the Loco shed. 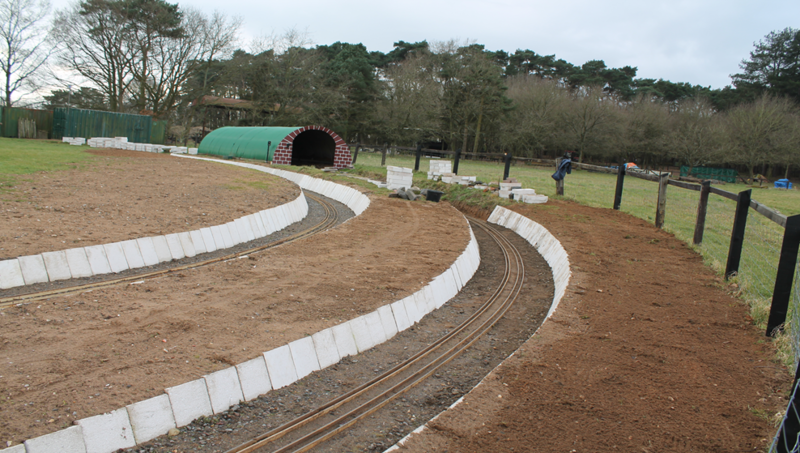 We have finished the blocks, except the tunnel needs a few to smarten it up, but we now need to just complete both tracks with a few more boards to make it really finished, We have laid some 1000 block since they arrived in November, we have had all sorts of weather but we have continued on, it looks great, but I am somewhat bias. We are looking next to build a small shallow pit under the 7 1/4” unloading area, and we are also waiting for the right weather to spray the track with weed killer and the grass has been sown on the soil area’s. 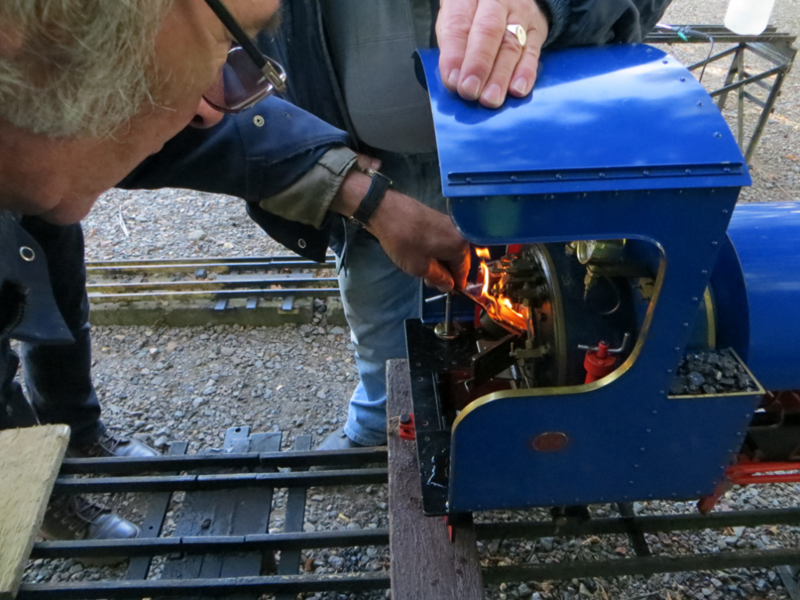 We have also changed the RED light at the station water tank with an AMBER light and are getting the cables laid for the new contacts which will space out the Loco’s. Five have already been laid, so we are coming on a pace. One day recently when we could not work. One day we did work, we all have got pretty hardy lately. Can any one do “Topiary” we would like these plants, to say “ Flying Scotsman” ????? Well, at the last sub committee meeting it was discussed and suggested that the Anniversary (RA) will be held over three days,. Friday 31st August, Saturday 1st September and Sunday 2nd run and clear up. All these discussions and suggestions are the way the subcommittee is going forward. 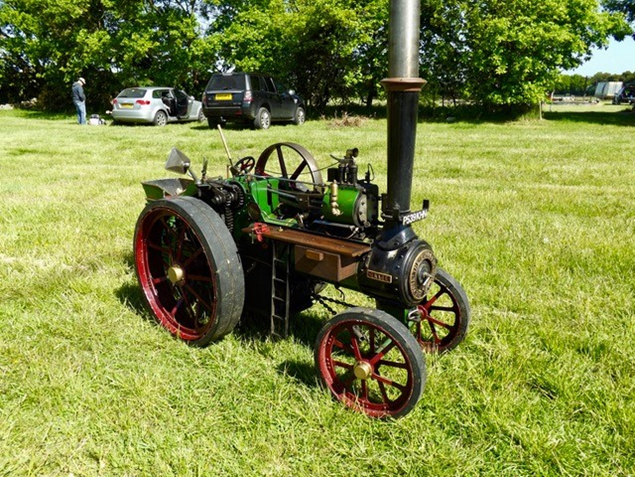 Friday 31st, we will erect the three Marquees in the morning then prepare for a road run of traction engines to the Saxon pub, members can walk across the field or follow by car. We meet up at the Saxon for a drink and perhaps a fish and chip supper. Saturday . 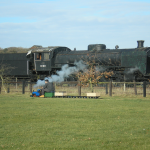 Steam up and play all day, tea and cakes at 1300, games to be arranged for both traction engines and Loco’s . Saturday evening 1900hrs a buffet main meal consisting of cold meats quiches, pork pies and numerous salads . Sweet no yet decided. Beer, Wine, Soft drinks. This will be a ticketed meal and a charge will be made in advance . Music and dancing. The will also be a raffle on Saturday. Sunday perhaps another run, but then clear up and every thing put away, ship shape. It’s a good show and not to far to go so come and have a nice day out. Hope to see you there. Hello everyone. Well it does not seem that long ago since Christmas, but here we are, and we have had our second meeting of the New Year 2018, so time does fly. Well, looking forward, we have two anniversaries to celebrate this year, The 50th for The WEETING Rally, and also our own 40th in September, plus the little shows in between, so it looks like being a busy year. One thing, I must congratulate the members working on the track, they are out there in all weathers and to have members of a club like this must be the envy of clubs around us. “WELL DONE LADS”. The sun will soon be shining and you will get a tan, and the heat will be too much. 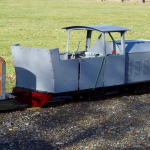 Well as I have said before, there are several new loco’s heading our way, and also some new traction engines and hopefully, my own loco will be up and running. We need ideas for both Weeting and our own anniversary, so please put you thinking caps on and let’s make these dates something to remember. So bye for now. Dave, your Chairman. Well a happy New year to you all. Christmas came and went, and another year beckons. This year is our RUBY Anniversary so I would like to say that if we start organising now we will come up with a wonderful anniversary. 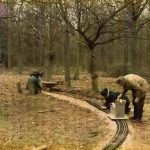 We are getting on with the track, and when you come to see it I hope you will approve, because it is looking good, well great. Just a small reminder, there are still a couple of members who have not paid their subscriptions, so please let Mike S have the necessary. We have gained a new member, Jason C and a new Junior member Sam H, welcome to our Club. We have also this last week had another new member Brian R and another Junior Peter M, so welcome to you also. We have also lost a member Allen W who has moved away from the area. Sorry to see you go. The calendar is getting filled in so if you have any dates you want to see in the calendar then please let me know. WE ARE FORTY THIS YEAR! "Let's together make it a weekend to remember, and have a whale of a time, come on lets do it"
The 14th January was our club lunch, a three course meal at the Olde Windmill Inn at Cressingham, 24 members with wives /partners, attended and it was a meal to remember, I do not think any one could have gone home thinking, I could have done with more of that. A very pleasant meal with very pleasant company. I look forward to next year, but I might have to change my choice of soup next year. It seems impossible for these two pictures to be taken on the same day. We all arrived in what was a flurry of snow, and said what do you think and but tea time the sun had come out ,a bit hazy but things started to thaw out, and by going home time this was the picture from the other end. Things have come on a pace , we are now working Tuesdays and Thursdays, and Saturday we are some times working but could also be testing our workshop work. But in a couple of weeks we will have finished the track from the tunnel too the straight in front of the big Finnish loco. "Here we are unloading some more blocks to finish this end of the cutting". 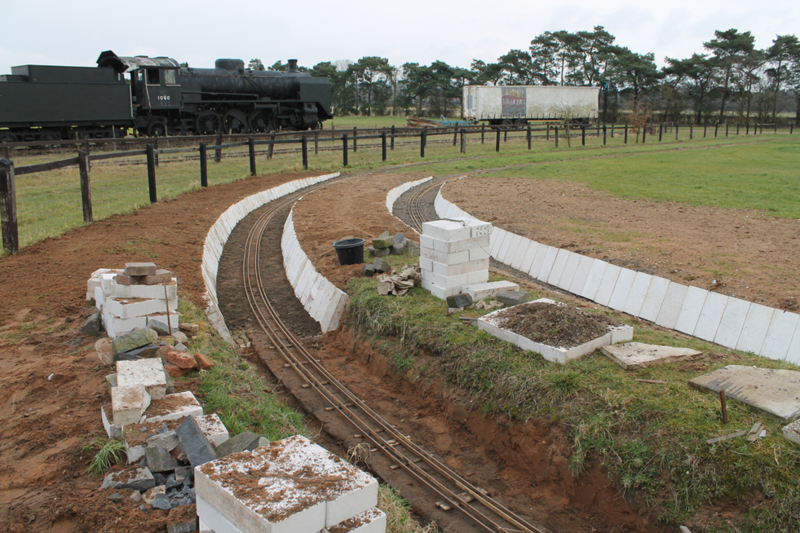 We have laid nearly 700 blocks so far, we have arranged then both side of the cutting on the inside and outside track from the loco shed Tunnel end round to the level earth at the end of the long straight. 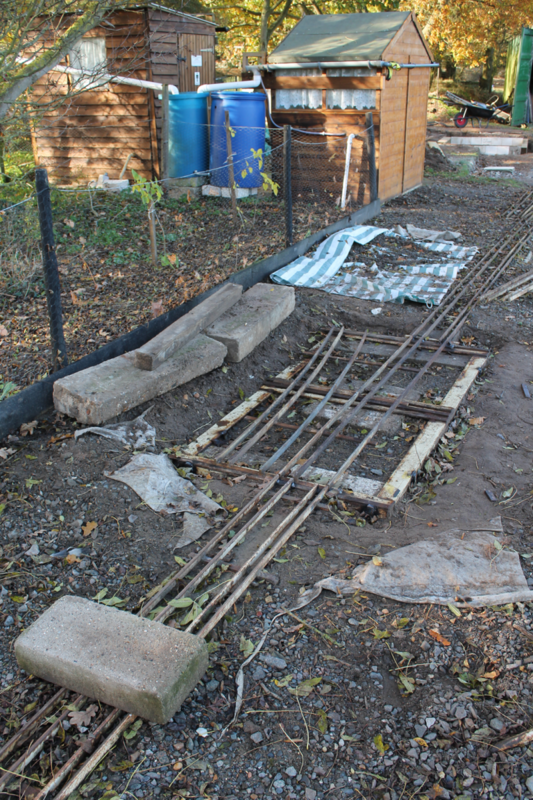 The track here was laid on original concrete blocks and these have been left in situ, with breeze block laid between these blocks, broken pieces have finished the track , where we have re-laid the ballast up to the under side of the track, you can see this from the picture. 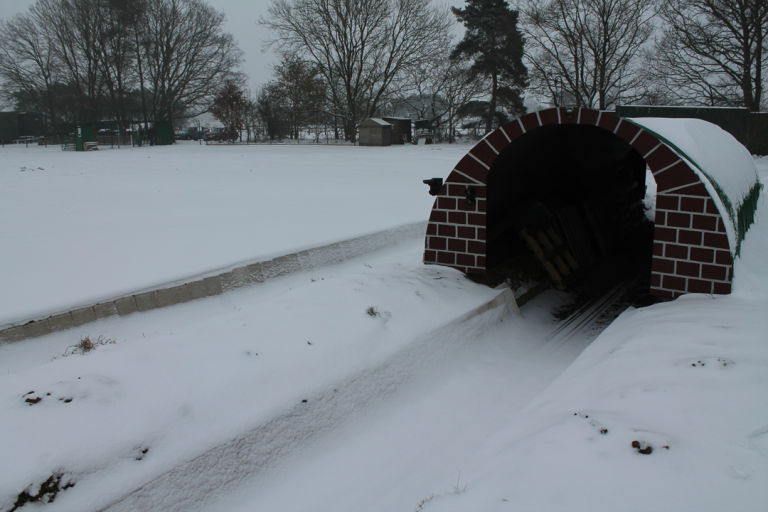 It has been pretty cold recently, but we have had a regular work crew and things have gone very well. 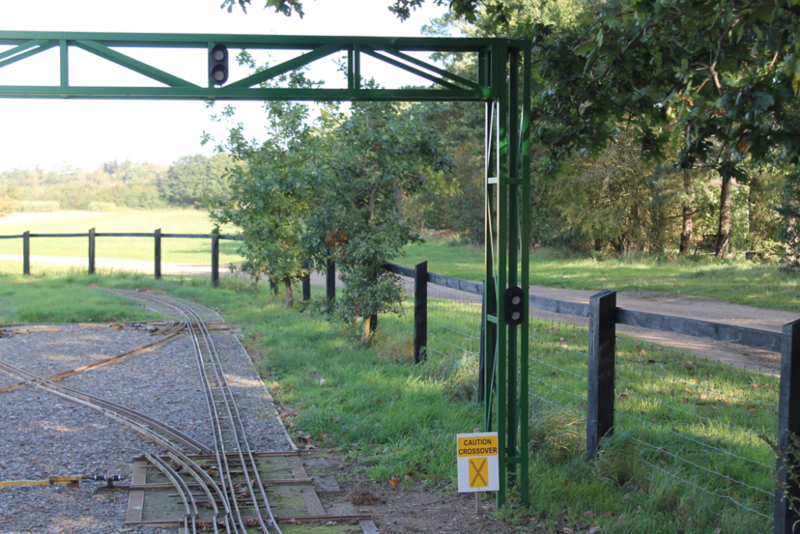 There has been some trolley testing and we have replaced two pieces of track on the outside circuit, just on the bend after the crossover. 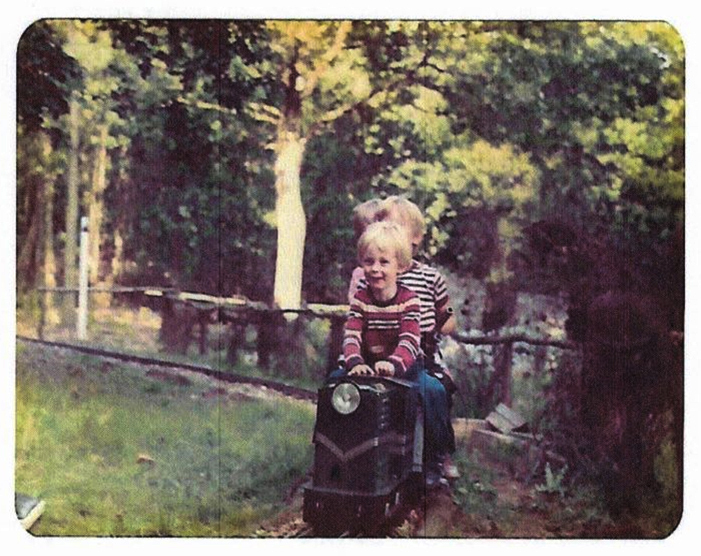 We were derailing here and when we cut the pieces out ,you could see why this was happening. All is well so if one wants to brave the weather Saturdays can be a running day. Well here we are again, the AGM is just round the corner, it does not seem 3 years ago since I became your new Chairman. 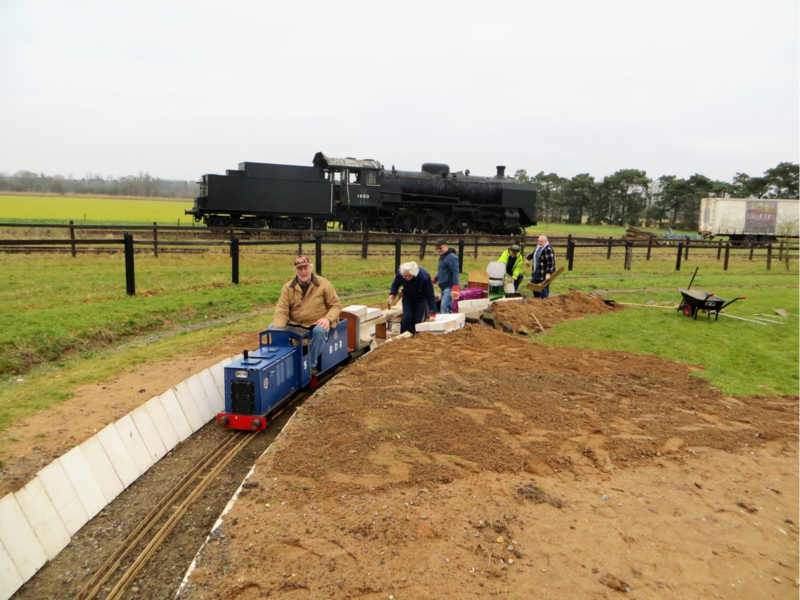 Well it has been a very busy 3 years with all the Improvements to the track, first there was the revamp to the steaming bays, which improved the loading and unloading of the locomotives. 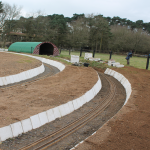 Then Christmas 2015 doodling on youtube looking at other clubs track I had a brain storm to ballast our own track and now 2 years later it has happened, this could not have gone ahead without a lot of dedication from the membership working Tuesdays, Thursdays and Saturdays to which I am very proud of what they have achieved. The AGM is on Wednesday 1st November at 7.45 so please attend so everybody can have their vote to say who they would like to see running the club for the next year. Its your club, your vote, see you there, your chairman Dave Moore. We had our fun day in September and this turned out to be a real success . I am now looking forward to Saturday October 28th when we will have a “HALLOWEEN” run, I have emailed you all, so far not many replies , but it is early day’s. Start at around 2.30pm and run hopefully till its dark, to get some experience of night time running. Could turn out to be pretty spooky. See you all there. 1st November 2017 which will be our AGM, so if you can come then it is time for you to have your say, in who runs our group. So again 7.45. A small reminder that 19/20/21/22nd October is the Midlands Exhibition, this is a very good show and well worth a visit. There is a celebration of 40 years at the I believe Halesworth MES on the same weekend 21st 22nd October 2017 this is being held at Ormiston Denes Academy at Lowestoft NR32 4AH if you want to go it is a £5.00 entrance fee, if you need any more info let me know. Web site: We have a new web site, www.brandonanddistrictsme.com there is NO password, and you will be able to see what is happening at our club along with other items including the newsletter I hope this makes thing easier than before, so go along and see what you think. General Interest I have a lathe for sale Myford ML7 with a gearbox and a speed controlled motor which you can make run at a very slow speed and then turn up to a nice high speed. 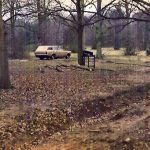 This also has a Myford stand and various additions. I know of an old member who wants to sell his ML7 no gear box but lots of additions both need to be seen ,also a C10 Warco lathe, and a Warco Mill/drill and a part built 2” Allchin. Local in Brandon. 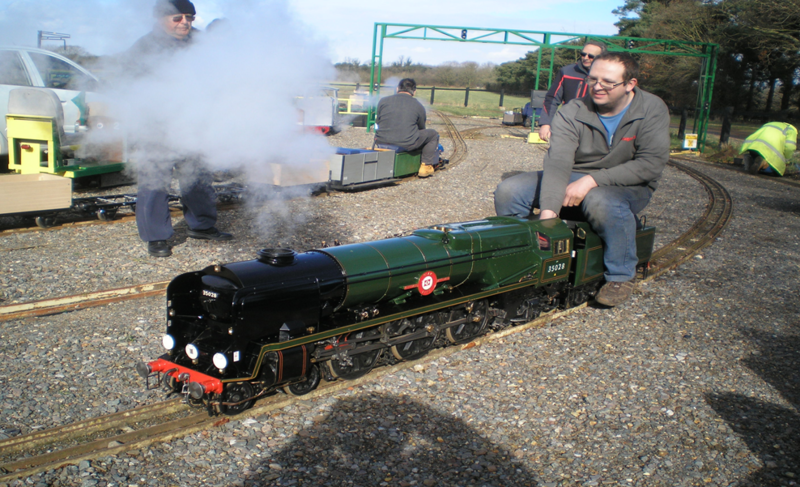 The two pictures above were sent in by Derek E, this is the first time his engine’s dynamo was working. Looks a fabulous engine. We have a new pod at the track! “ Cariad” a right Welsh name, all are various shades of Blue. All are different but the same basic engine, so watch this space, along with Hugh S, “Sweet Pea” I do not think his has a name, and our bigger brother Andy G “Sweet William” perhaps next year we can have a Sweet Pea Rally? As they all get used to our Brandon track I will keep you all up to speed with there “development”. So we will keep you informed on our play days and perhaps if you want to drive an engine, you could be lucky. We are continuing to upgrade the track. 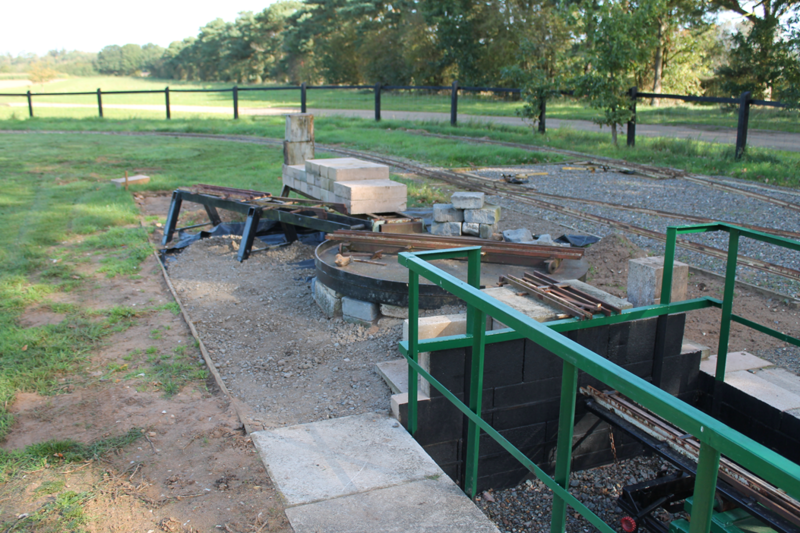 Since we had the last 10 tons of ballast, we have finished the track from the bridge up to the Ladies Loo; we are now ballasting the moveable track from the ladies to the Loco shed. 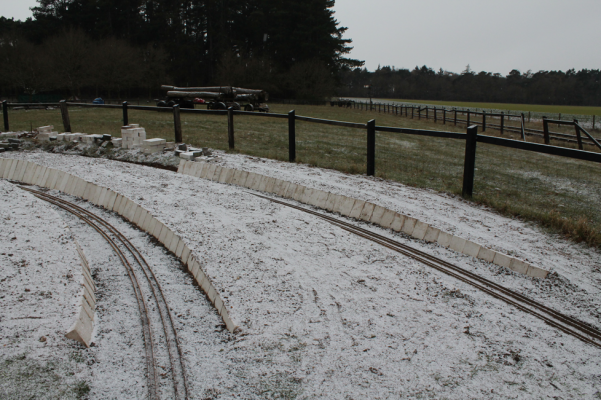 We are having to be careful here as we do not want any ballast too high which would interfere with the movement of the track – this is still ongoing. We have started to ballast round the turntable and this will make it easier for the tractor to mow the grass – this is also ongoing. We are not allowed at the track on a Thursday due to the shooting season, but we are there on a Tuesday and Saturday, Saturdays being mainly play days more than work days. Mike H and Mike S are installing new lights at eye level on the gantry, also ongoing, so watch this space and another update in Decembers newsletter. Picture One shows another set of lights at eye level on the leg of the gantry. Picture Four show a picture taken on 8th October 2016, so, some advances can be seen. The engineer comes to talk to the Chief engineer. I’m having trouble with the power supply you put me to work on. OK , lets talk about it, is it Oscillating? No said the engineer, but it is stable. Is there any ringing on the gate? What about the noise and ripple? These are well within spec. THE DARN THING IS ON FIRE.